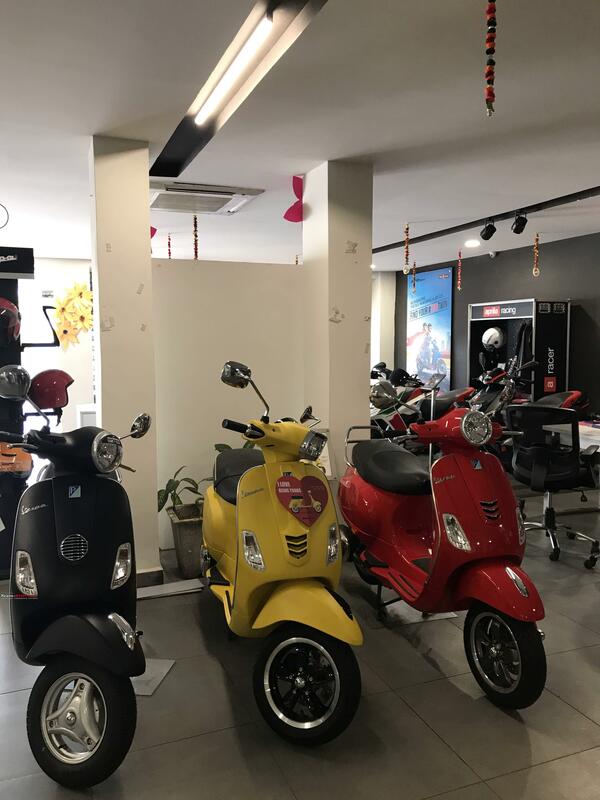 Deciding on a vehicle to buy in today's age can be a daunting task - as I found out recently in my search for that quintessential scooter. 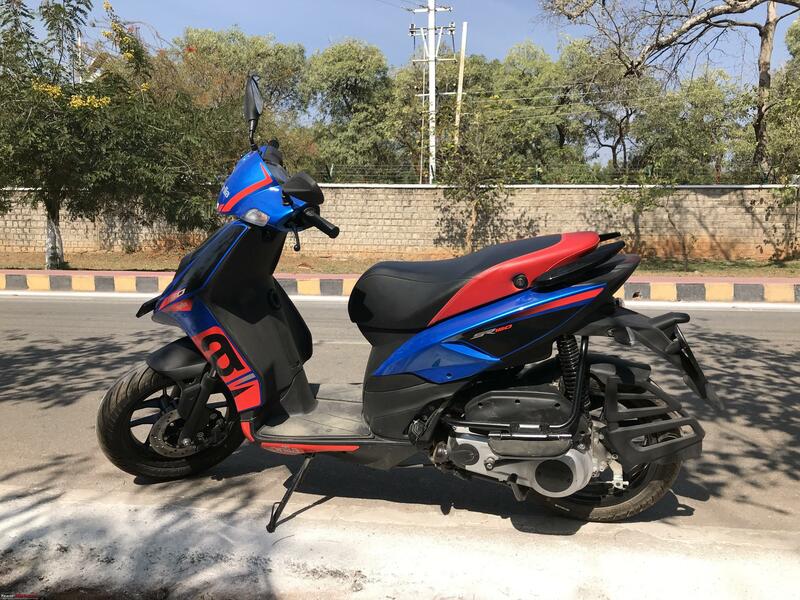 I overshot my budget by a good margin, bought something so tall that I can't keep my feet flat on the ground, mileage is just shy of reaching 35 kmpl etc. 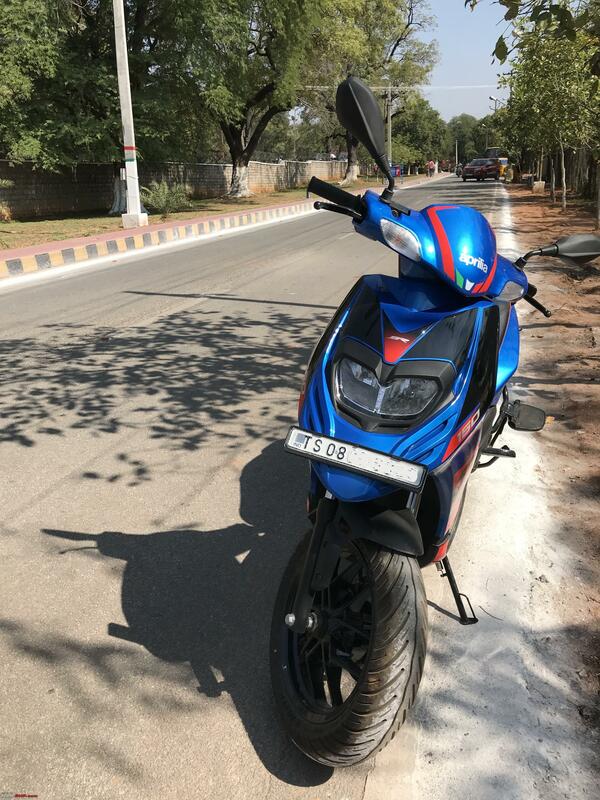 But I love my SR 150 as I have discovered after spending a good amount of time with this awesome piece of a machine, notwithstanding the minor niggles that I have experienced. I have tried to describe my buying process and the days that I have spent with my SR so far in this thread. And I hope that the pictures do some justice as all of them have been captured on my phone. So here it goes. 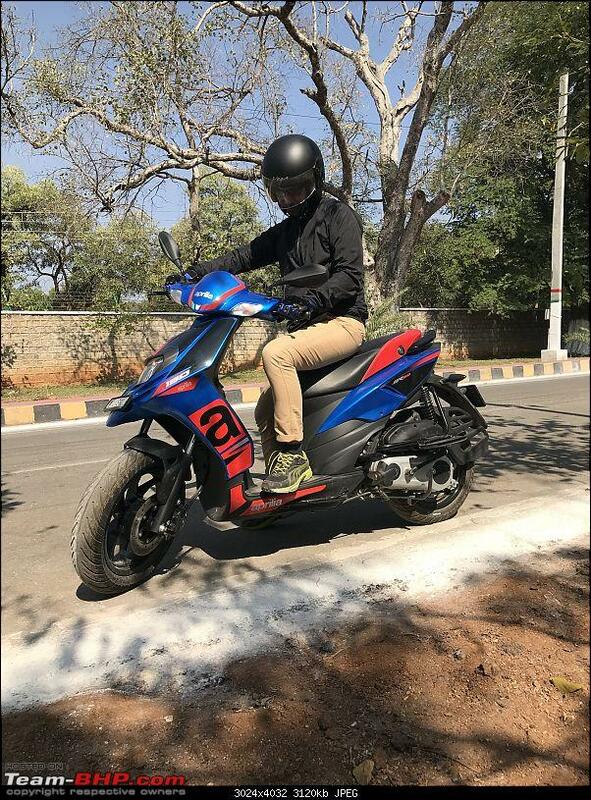 The 2 wheeler industry has matured to a whole new level, helped of course through some path-breaking (or rather timely) models launched by the erstwhile Hero-Honda consortium and of course the Pulsar series from Bajaj. 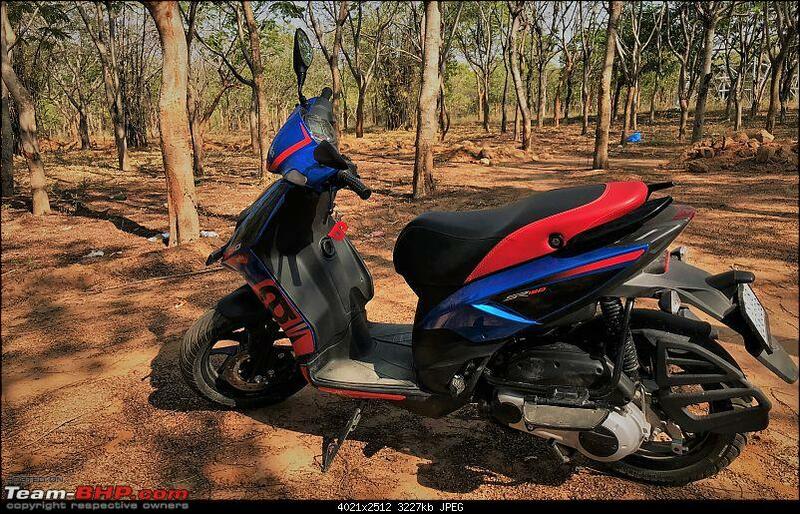 I think it was the CBZ first launched during 1999 or 2000 which changed the perception of how we look at 2-wheelers, and then it was the Karizma later which gave me goosebumps whenever I looked at one, a faired bike was unheard of a few years back. The transition from the Chetaks, the Rajdoots and the RX-100s took a while but it came in surely. 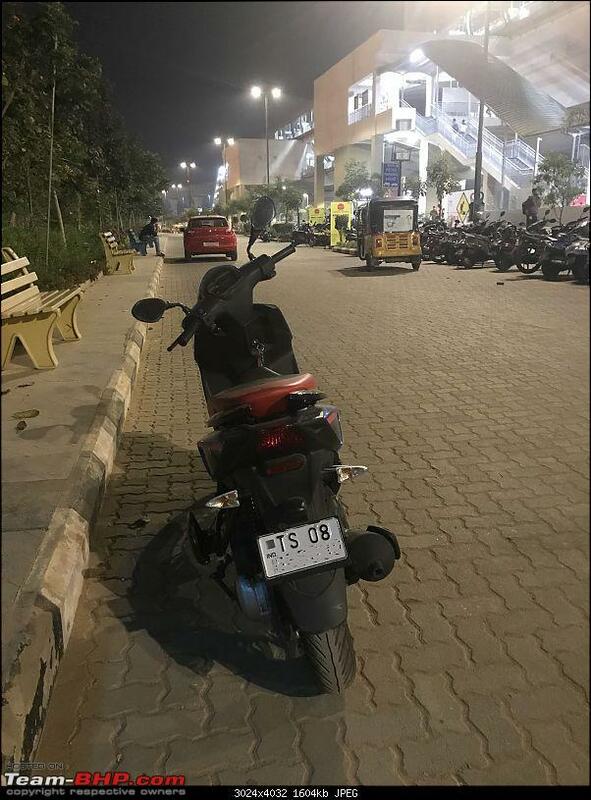 And then we had a watershed moment when the Activa was launched, lot of products have come and gone but it managed to single handedly resurrect the automatic scooter market. The dominance has been such that other manufacturers have been happy to be playing a distant second or even the third fiddle to the leader. A quick glance at the sales figures: More than 2 lakh Activas are bought on an average every month while the second placed Jupiter sells only around 60k units. So the point is, there is not much to think when buying a scooter or is it? Lot of water has flowed under the bridge since then and now we are in a situation where we are spoilt for choices (Some bhpians may disagree). There are so many models and new launches happening that YouTube vlogs are becoming commonplace and my feeds are full of those because I happened to check a review once. It’s a different thing altogether that none of them are of the tbhp quality and you end up confused than ever before if you do happen to follow those. But the problem is - how do you decide, a needle in a haystack problem, at least for me it was when I started. 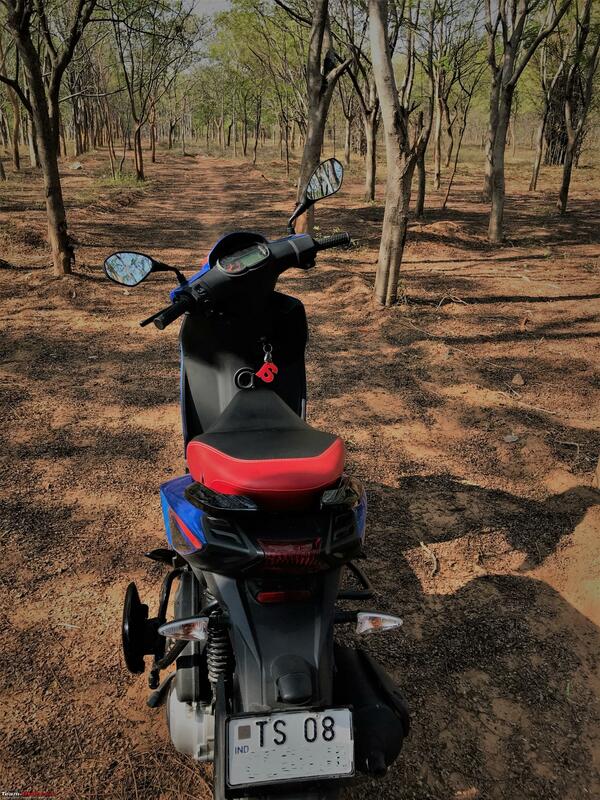 So I started with the most basic tenet of vehicle buying: I decided that I need a 2 wheeler. 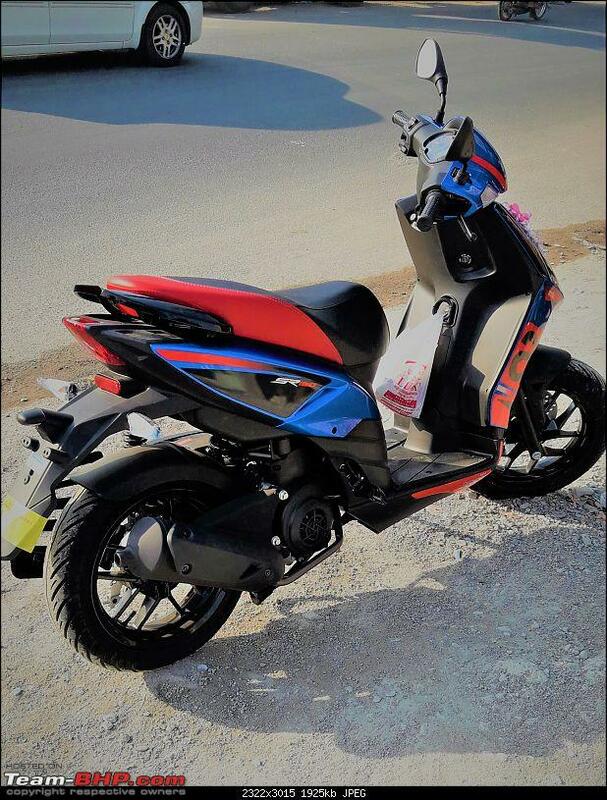 Since I already own a Pulsar but which is not with me right now (sent it to my hometown) I decided on a scooter. And since I am married now, a scooter made more sense. I thought I would go for something which my wife will be able to ride as well, but it has become a challenge because of the SR 150 (Did I mention the scooter being tall?) let's see how it goes in the days to come. 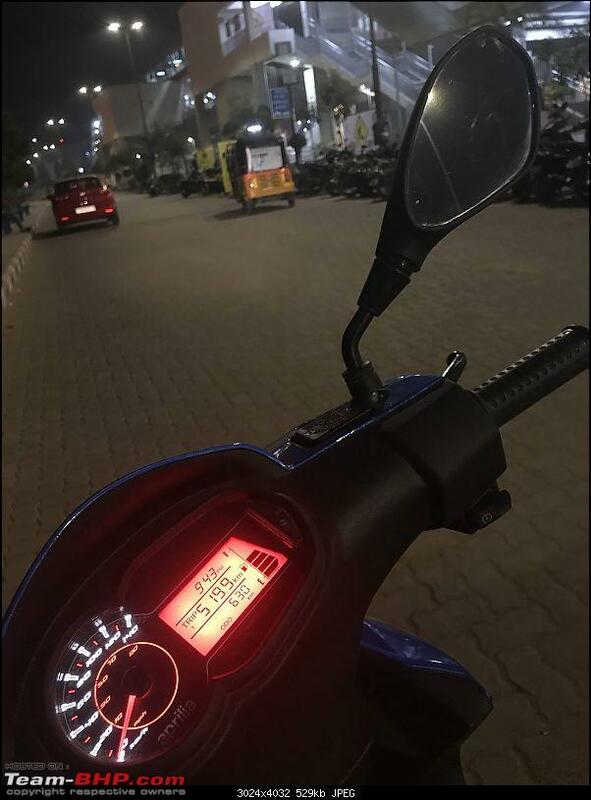 Now I thought that the maximum one can spend in a scooter is around 70 k, there is no point in spending beyond that. 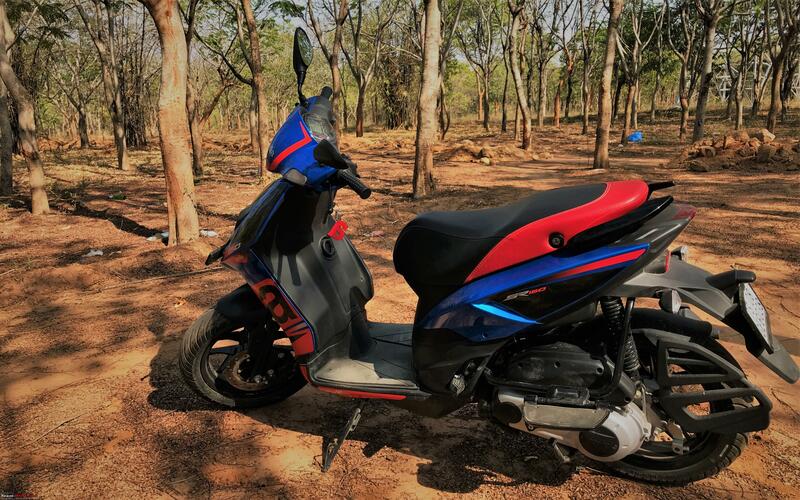 You get all the utility you would ever need within that range in its 5g form (read Activa). So why would any sane person ever decide against it. But I decided, in a newly found realization that I like going against the tide so didn't even go near a Honda dealer due to this. 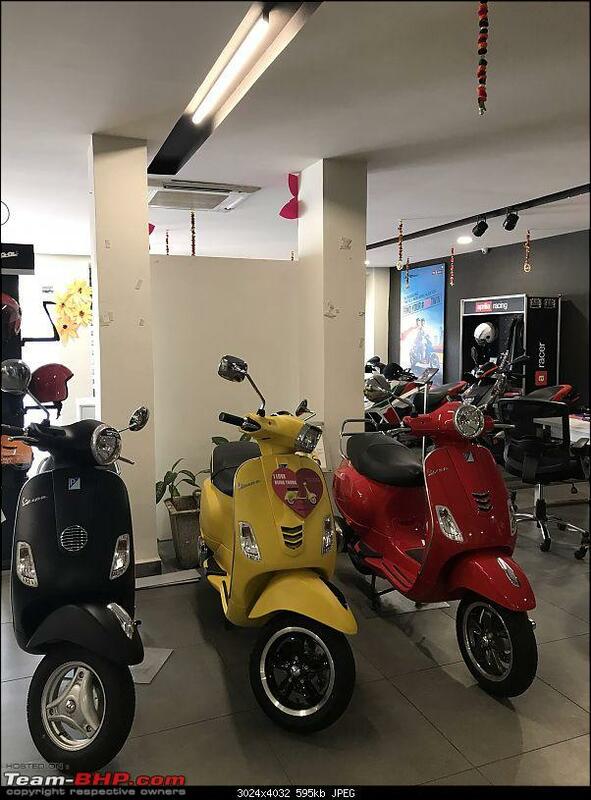 The result, other scooters like the Dio, Grazia etc. got sidelined. I did check out the Dio in the later part of my search as an updated version had just been released. I was in fact about to buy a Dio back in 2010 instead of a Pulsar but the dealer I went to told me that the waiting period was 4 months or something and the only readily available model was in a shade of pink. 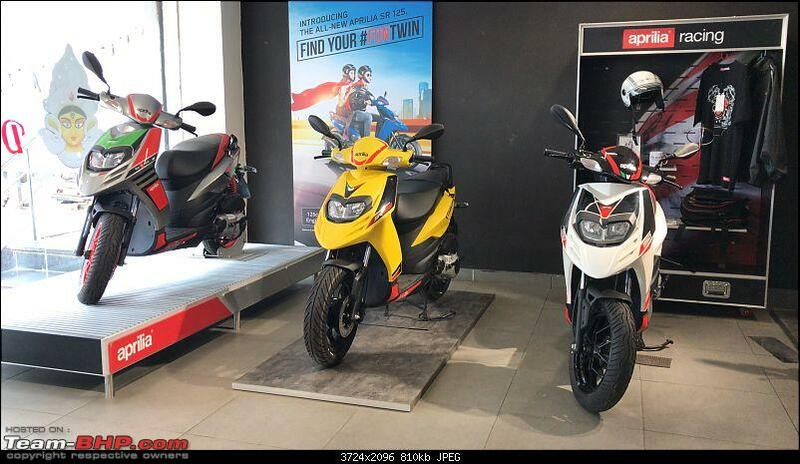 In comparison the Bajaj Dealer had a bunch of Pulsars ready to be delivered. 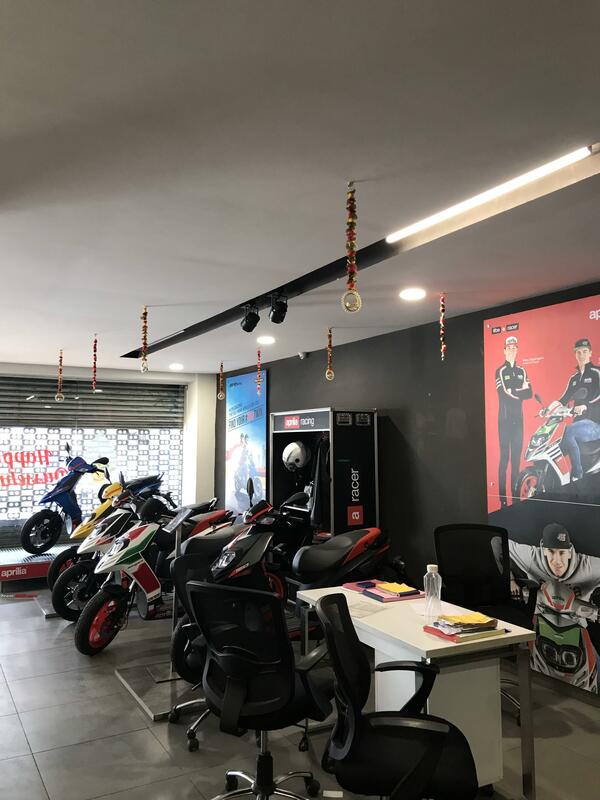 Shift to 2018, dealer experiences for 2 wheelers haven’t changed much, we still have the bored sales guys going about their job, misinformation is rampant and Activa is still the king since time immemorial. That’s how it was going for my scooter search. Now I had my shortlists as well, the very elementary step of going about on a shopping spree. 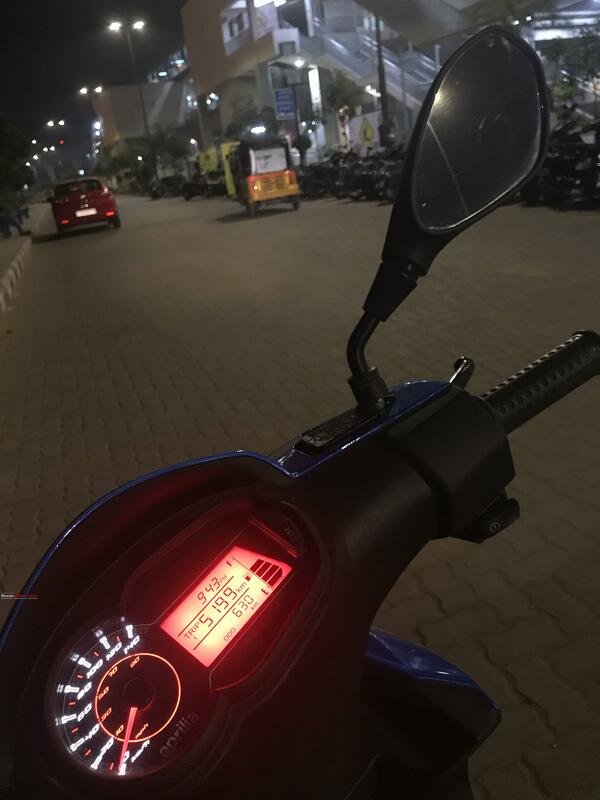 Had the Dio and the Yamaha ray in my radar cause I didn’t want to spend too much, thinking I just had to worry about a 7 km commute to the Metro Station and back and of course the occasional biryani runs (Yes getting a biryani was on my list of need as a lot of the food delivery apps do not deliver to my area, which is good in a way) near to my colony. My first biryani run, and I just love the convenience. Then I saw the Ntorq and wondered, how is this scooter not on my list? The world was fine till then until the government decided to bring in the insurance law. 5 years of compulsory TP insurance cover along with PA and own damage jacked up the prices by more than 5k. 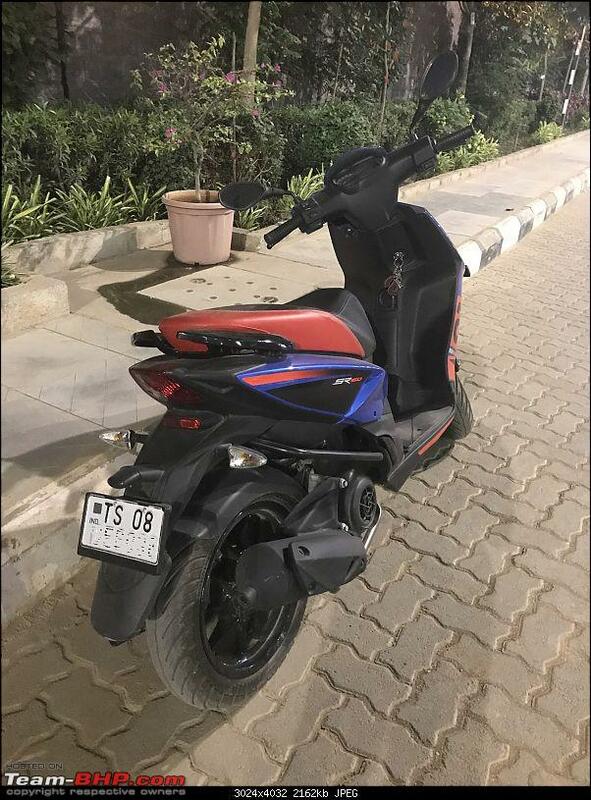 So the Ntorq price went up from around 74k to more than 80k and all I could think was: 80k for a scooter, seriously? Anyway as part of my search I filled up online forms for all of the manufacturers. Funny thing is I got to the Aprilia site through an ad that popped up when searching for the site of the other manufacturers. After a few days I got a call back only from TVS and Aprilia. First up was TVS, got a call from the call center and was directed to the nearest Dealer promptly. I landed up in the dealer at the scheduled time but I don’t think there was any sort of co-ordination for the time I was told to visit between the call-center and the dealer. Anyway after a few minutes of aimlessly walking around with a hope of being solicited, discarded the hope. I saw the dealer folks sitting on a corner and approached them asking about the Ntorq, the on road price, discounts etc. etc. Got the quote of around 81K with no discounts whatever. 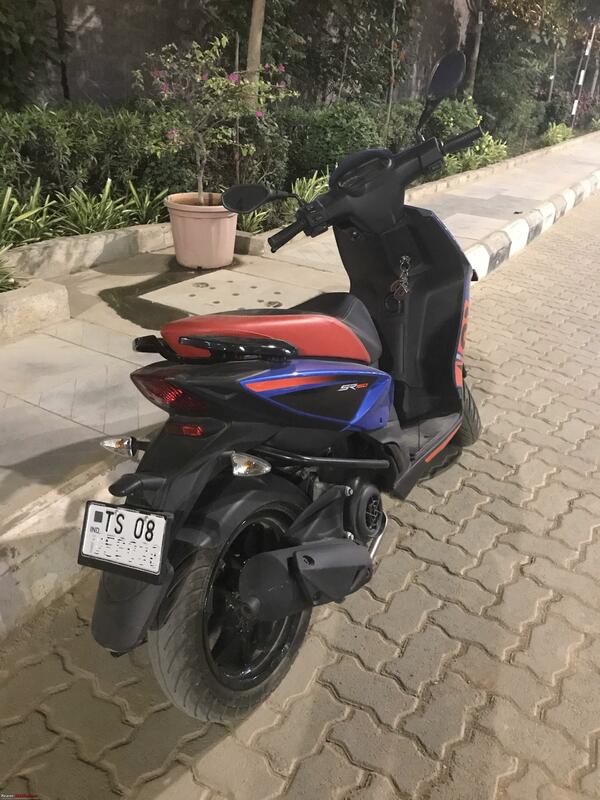 Asked for a test ride to which initially I was said no but they decided to give me the scooter that was waiting to be delivered. I was reluctant at first but went ahead nevertheless with a self-made promise to be gentle on the throttle. The dealer folks brought the vehicle down the pedestal and off we went with a service guy as pillion. He kept on egging me to go fast to check the performance. 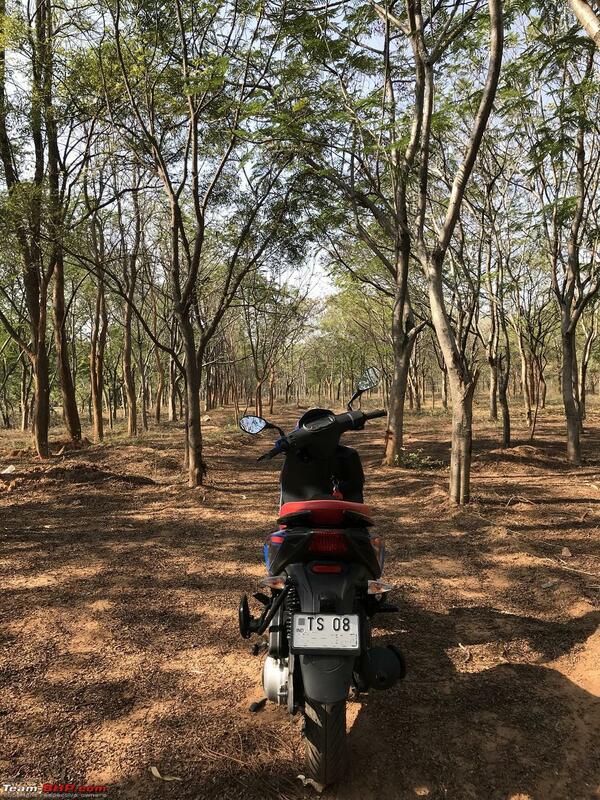 Test ride done, clicked a few pics and asked around about the other formalities. The ride was good but it ultimately felt like a scooter which are inherently unstable contraptions on 2 wheels. 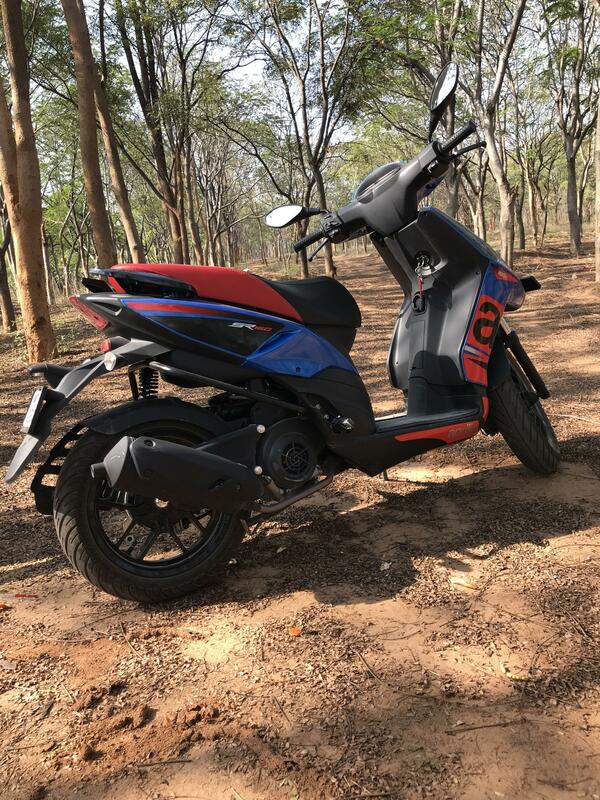 The Ntorq however is a great product in itself from TVS and I respect them (along with Tata) for the products they have been launching lately. Bookmarked for later. Next stop was the Yamaha showroom. The folks there were receptive and was asked about my need right away. I asked them for the details of the Ray-Z, they remarked that the model had been discontinued and I have the option of the Ray-Z street rally edition or something. On checking out that particular model was taken aback by seeing how you can put some unwanted contraptions around a relatively good looking scooter and name it as such. First impressions purely and I didn’t feel like taking a test ride so moved on indicating I will get back later. The quote indicated a price of around 75K which according to me was not a value for money proposition at all. Now I hadn’t given a thought to the Aprilia or Vespa scooters at any point of time during my shortlisting process. The initial asking price was too high for my budget. 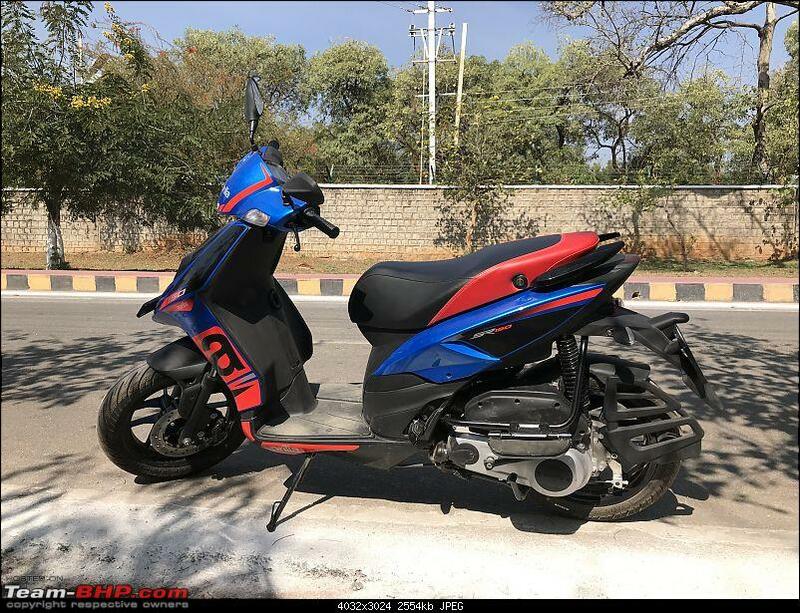 I actually went in to the showroom to check out the SR 125 as the price was almost the same with Ntorq so just for comparisons sake I went to the showroom nearest to me while still being around 7 Kms away. For the other showrooms I just had to cross the road from my office. Took a metro ride to the showroom while thinking about how things will pan out. The showroom experience was quite pleasant as compared to others. All the vehicles were neatly stacked and laid out, good décor, less crowd and the front desk staff were courteous too. I had in fact received a call from the Aprilia call center when I had filled a form in their website. In this case I was followed up through a call from the dealer itself and they had queried me about the time when I would make a visit and if I would like a test ride. 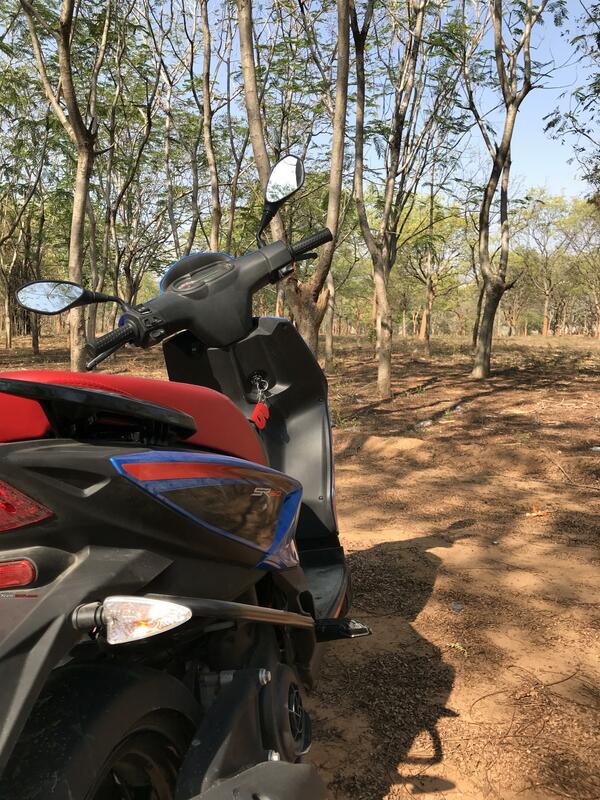 The test drive vehicles were ready when I reached and I had all the vehicles at my disposal even a Vespa, I decided to go with the SR 150 first. I was provided a helmet before getting onto the scooter, the TVS folks didn’t care less whether you wore one or not. The roads near the dealership was newly laid and I got a chance to get a good amount of Kms under the wheels. 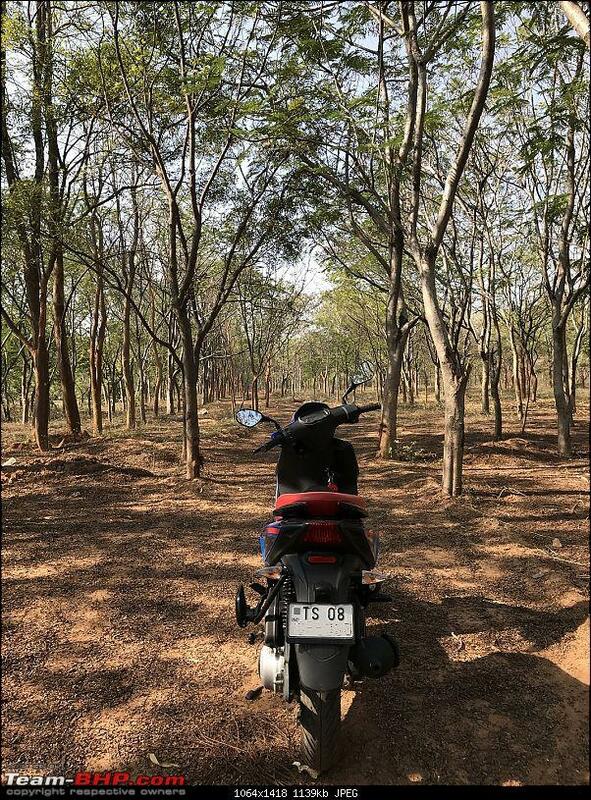 I had ridden a lot of commuter 2 wheelers before but nothing like the SR 150 till date. The handling was supreme with pin-point accuracy, you could feel it while taking a turn etc. Didn’t feel like a scooter at all. The engine sounded a bit unrefined but nothing of the sort that was a deal breaker. 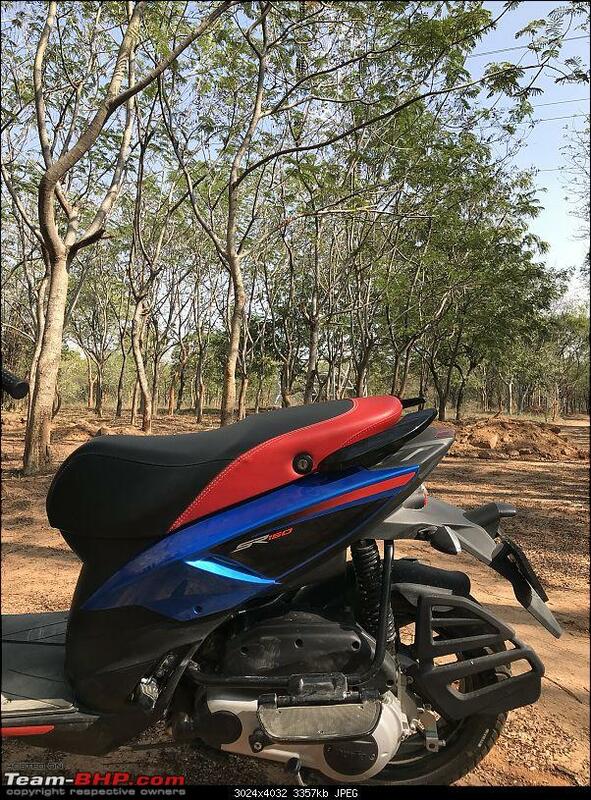 And the way it looks is simply amazing, got onto the SR 125 next, some elements were toned down like the grab rail and the seat which will make you want the SR 150 more. Anyway this time around there wasn’t any amazement, went in a straight line and came back right after. There is a marked difference as expected in the throttle response and the straight line acceleration. If you do decide to get an SR 125 do not test drive the SR 150, period. And I decided if I do buy myself an Aprilia it has to be in the 150 guise. So went ahead and asked for the quote to be prepared. 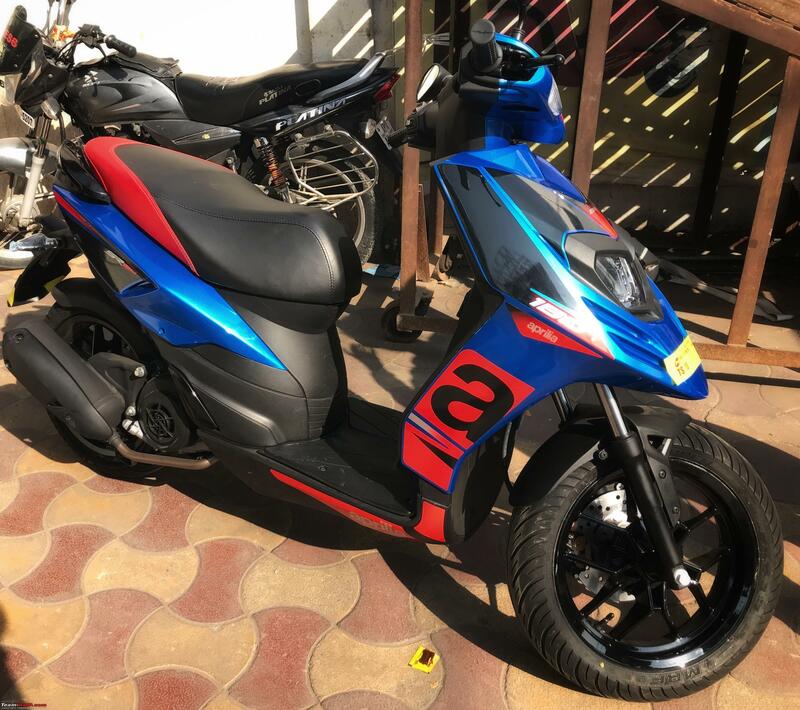 Was in for a pleasant surprise because as per some Festive offers the discounts ran into the tune of around 10k on the total on road price. 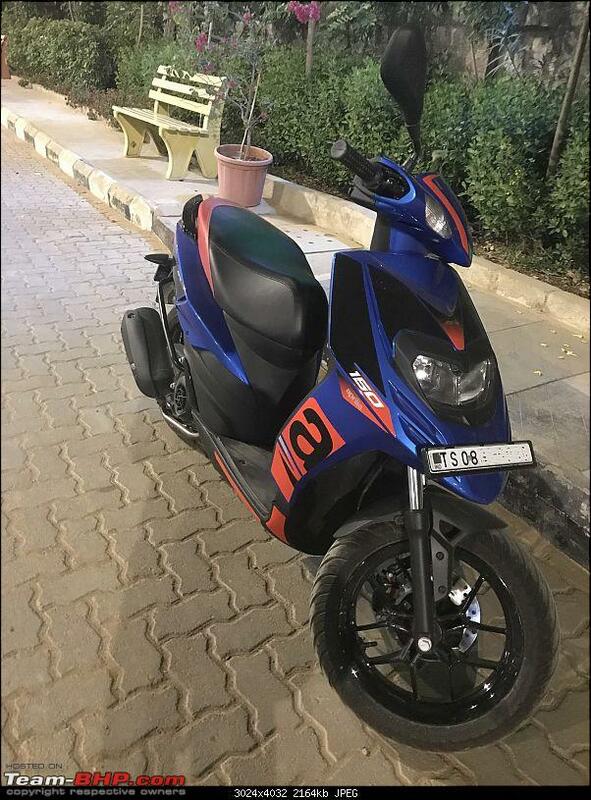 So basically I was getting an SR 150 for the price which was almost similar to the on road price of an Ntorq. Booked it right away through PAYTM. Some of the PROs which tilted my decision in favor of the SR 150. When buying stuff I usually look for the things which I need rather than what I am missing so not listing down the CONs but will mention some of the aspects later. The one area where the dealer experience was not up to the mark was on the delivery day. The Sales person assigned to me was on leave and so were the other folks. I think I must have been the first person in their history who took out the vehicle from the basement on his own and drove away with it. I was not expecting a grand ceremony but a little bit of attention would have been great. I didn’t get the manual, first aid kit and the likes as well. Did a check on the VIN verified the manufacturing date and that’s it. Even the perimeter frame and the connectivity device which I had paid for weren’t installed on the vehicle. 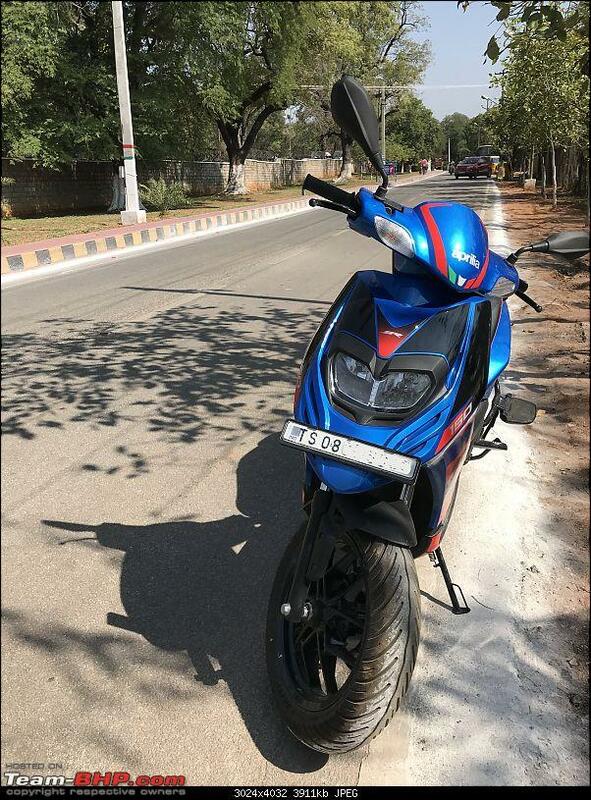 The solace was that I got my hands on a gleaming blue Aprilia SR 150 and there was an uninitiated grin all the way back home. 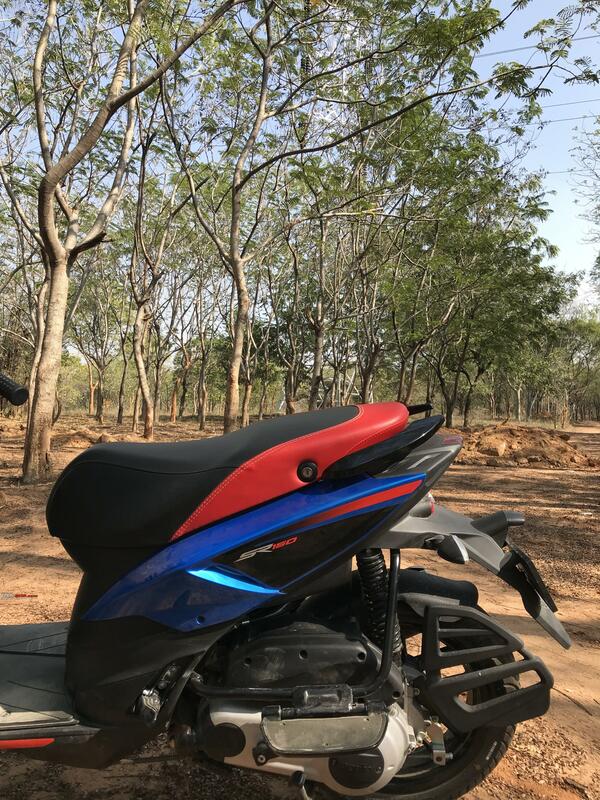 A well designed saree guard (and yes on a scooter). 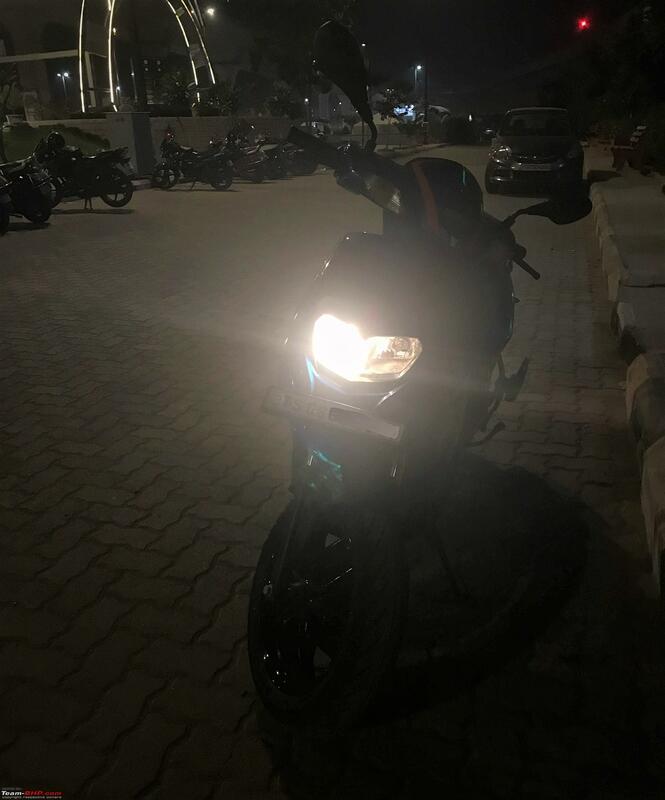 I took delivery of my SR 150 on November 25th and have completed around 750 Kms at the time of writing this thread. It is still in the running in period so haven’t gone beyond 70 KMPH. 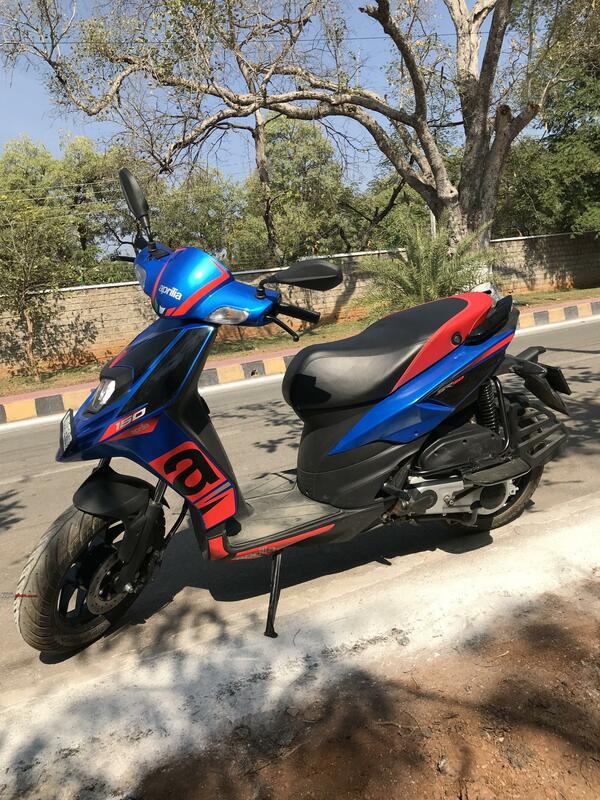 The manual indicates the running in period to be around 1K Kms and the speed should not exceed 95% of the top speed mentioned (which is documented at 95 KMPH), didn't receive any kind of guidelines on this from the dealer. Also we are supposed to be riding at varying speeds, not sure how that is to be done exactly. 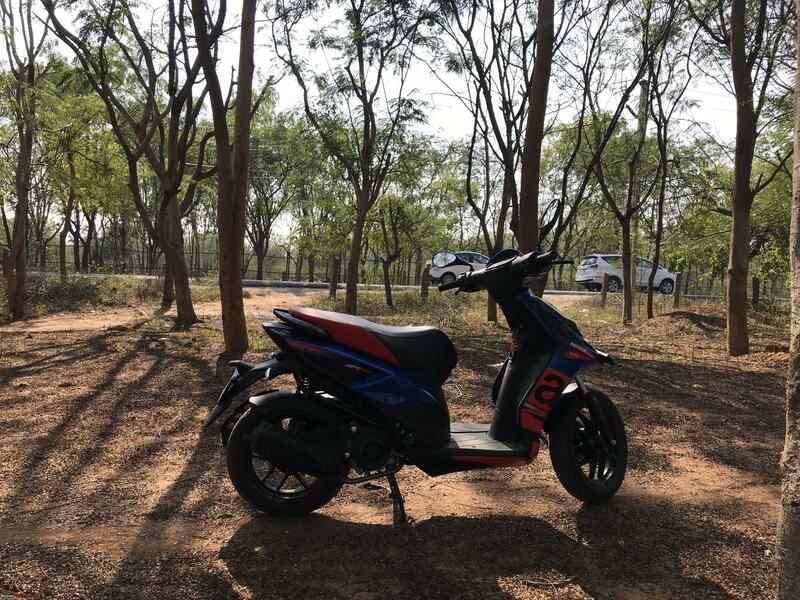 Apart from my daily commutes I have been using the bike so much that the fuel expense for my car has been less than a thousand bucks for the past month. It is also partly due to the fact that I have started using the Metro more often here at Hyderabad. On one of the days I also raked up more than 150 KMS in a single day within the city as I had to travel to the far ends on some errand. 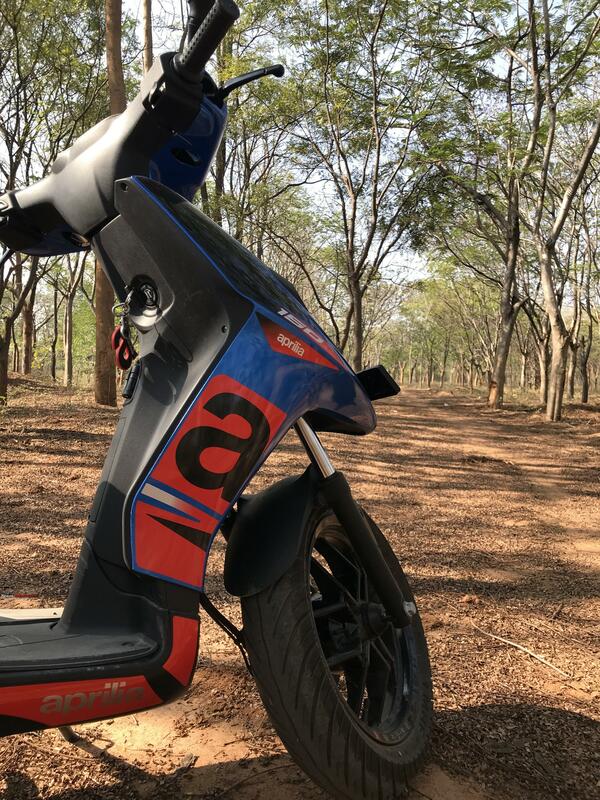 When I was riding around with the TR stickers I used to get a lot of queries from folks passing by on the cost, mileage, whether it was an electric bike (50% of the time it was this) etc. 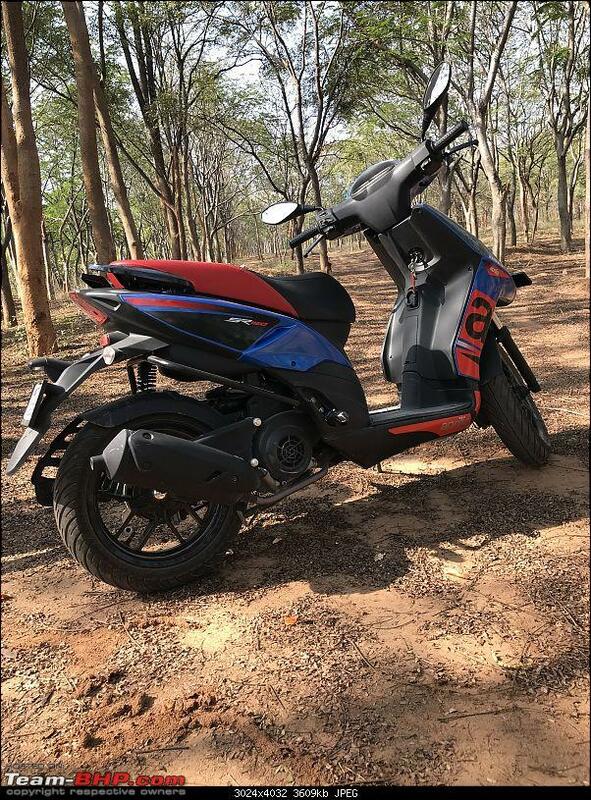 At one point it became irritating as well, I bought a 150cc sporty scooter and you think this runs on battery, really? Fortunately the queries have died down once I got the HSRP fitted. Deep dive of the novelty factor just with a sticker, sigh. 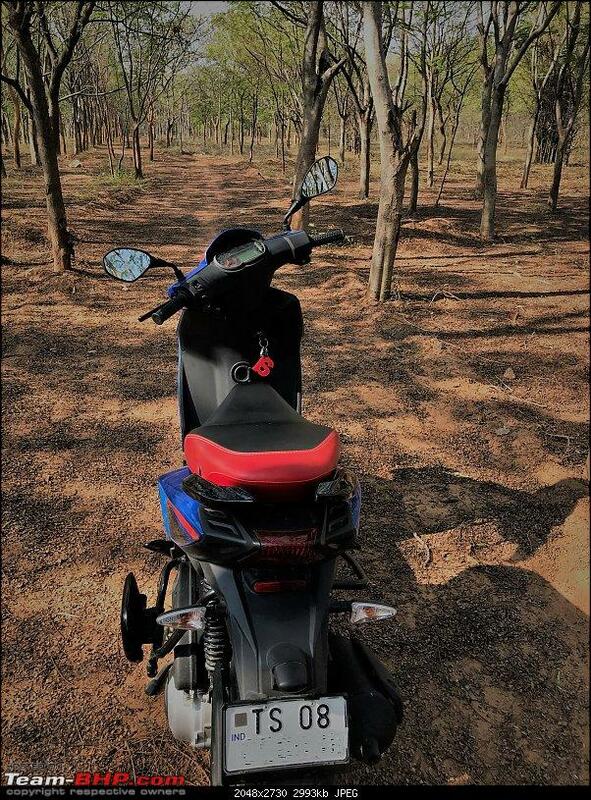 The ownership experience has been mostly trouble free, the primary inconvenience faced is the ride quality on bad roads. The suspension is so stiff that while riding over a pothole you would feel that the wheel is connected to the chassis with a single rod like a cycle without any hint of a suspension. On a particular stretch of the road near my area the experience has been so bad that I immediately signed a petition on change.org to repair the road. 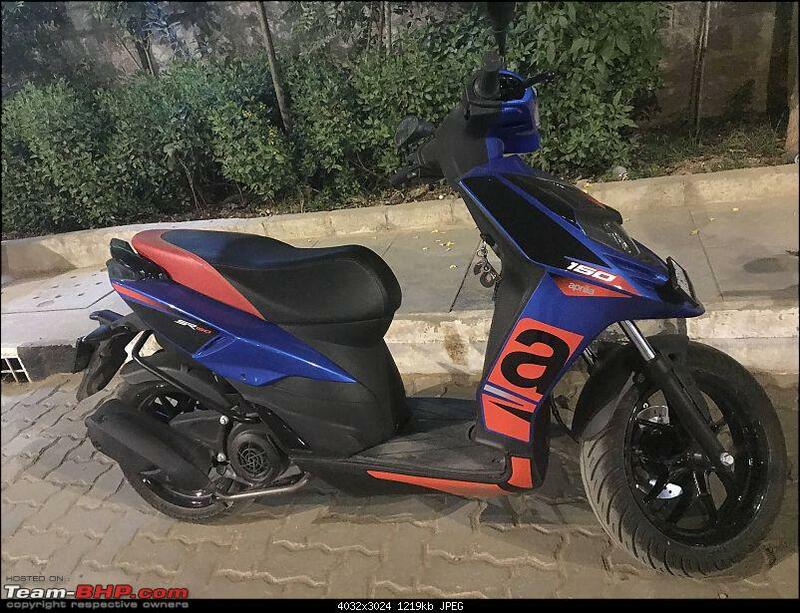 In fact the municipality or PWD folks should ride an Aprilia SR over the roads to certify it before handing it over to the public. I was immune to this earlier when using my car as the bumps do not show up that prominently through a 4 wheeler. Needless to mention that I have stopped using that road ever since. It is in the best interest of the man and the machine that we are in a controlled speed wherever the roads are bad, meaning potholes, cracks etc. On roads that are well laid out this scooter is the king, you feel encouraged to take corners and accelerate without any effort. 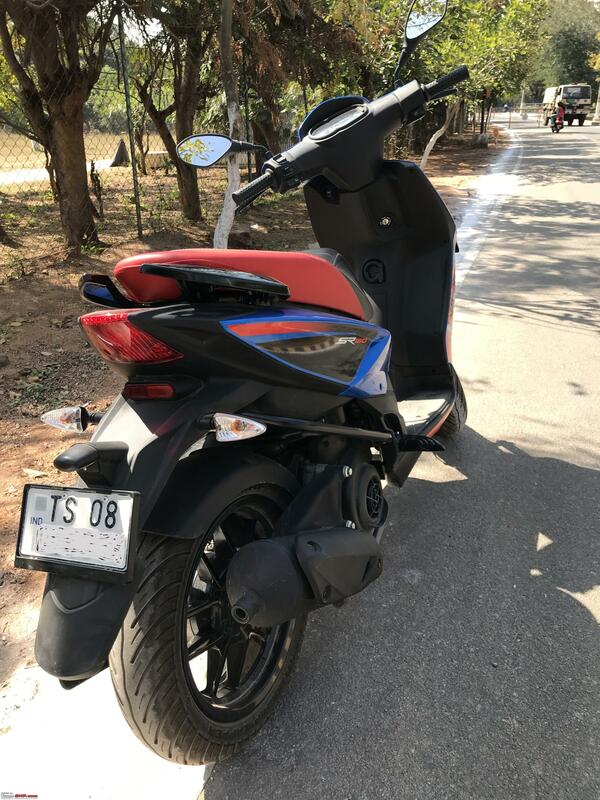 I missed out on the ABS version but the braking performance is adequate as I have come to terms with the relative physics needed to stop the bike when needed. I used to ride an Apache RTR few years back which belonged to one of my friend, disc brakes were a new thing then. 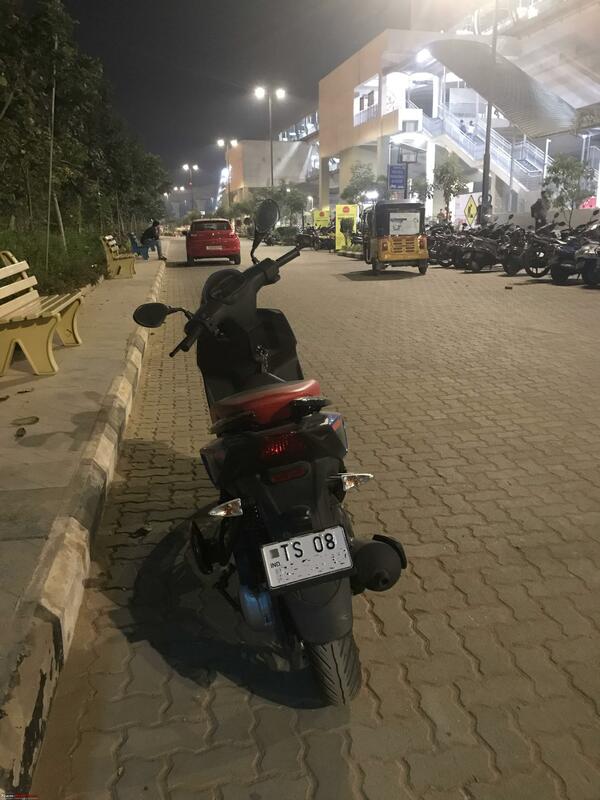 That particular bike had a dubious record of making every single person who rode the bike fall due to sudden braking including myself. 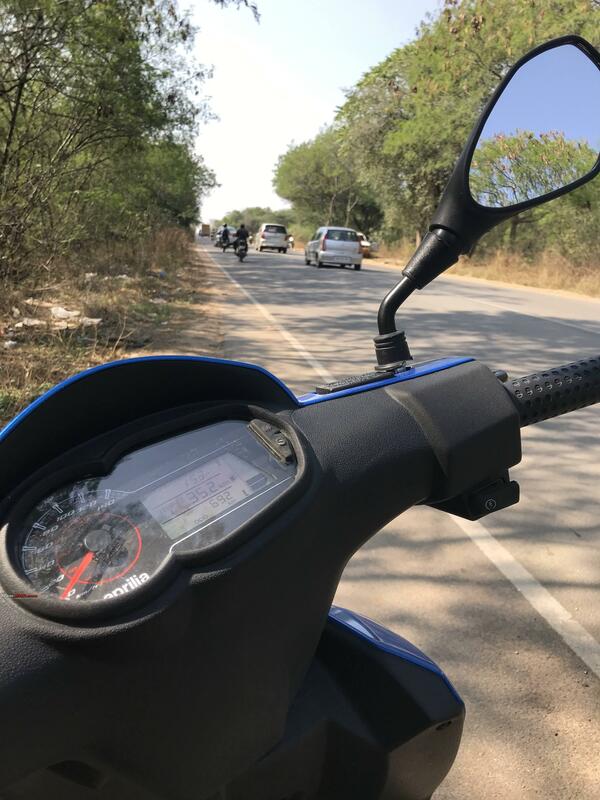 From that moment onwards I learnt the virtue of using both the front and the rear brakes in tandem and that tenet has served me well through the years. 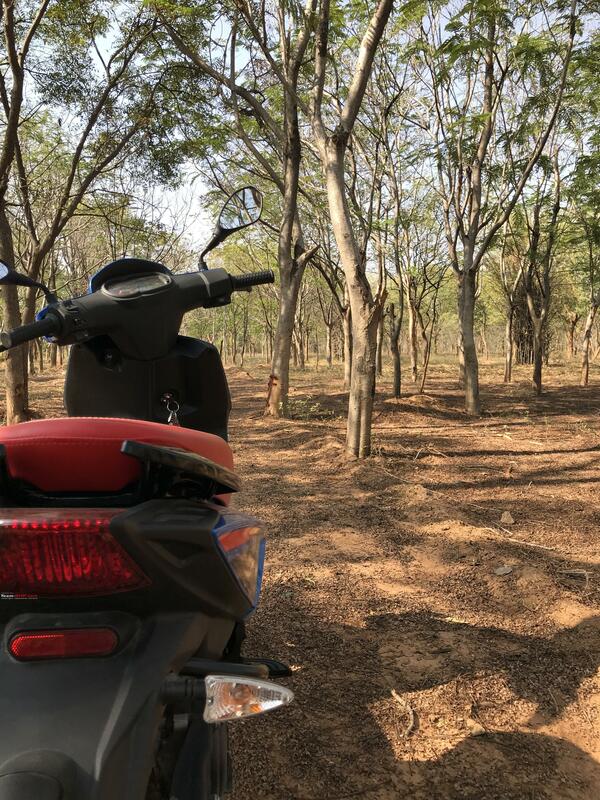 But scooters are still a tricky lot, they are deceptively fast, I never felt confident riding around in an Activa or other scooters. Panic braking was a strict no. 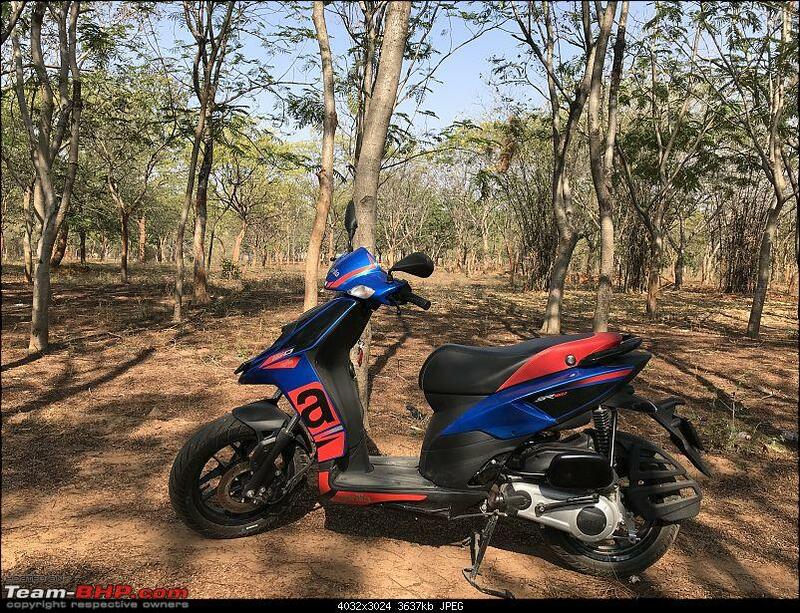 But the Aprilia comes as a breath of fresh air among the current lot. The bite is reassuring and stops the vehicle precisely when needed. The new SRs comes shod with MRF rubbers which are bit better than the older Vee rubbers on wet surfaces which was one of the gripes as I have been told in SR forums and whatsapp groups. Having an MRF make rubber will ease availability as well when needed IMHO. One problem that has cropped up recently is a squeaking noise from the front disc calipers or the alloy hub (not able to find out exactly). The service center guys applied grease around the hub and attributed it to the speedo cable lacking the requisite lubrication (whatever that means). Will ask for a check again during the second service. Overall I am quite happy with the Scooter. I intend to keep updating this thread with the relevant milestones for a fact check on the ownership experience down the line. Unlike my Alto, have managed to keep a tab on all of the fuel expenses in the Fuelio app. The average returned is around 34 KMPL which is on expected lines. In the month of December my total expense on fuel on the SR only was 1300 rupees. The first service was done within a month of ownership, it was a free service but had to pay for the oil which was billed at 384 rupees. 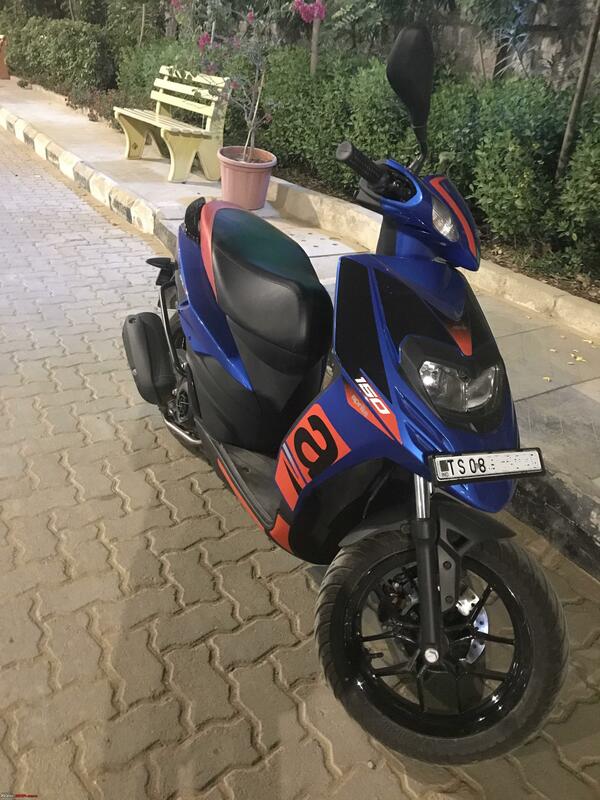 The second service is paid (Edit: It was a free service as i was not charged for anything other than some consumables and also I am free from the squeaky sounds and the front wheel rotates much more freely now) and I have been told that the costs hover around 500 to 600 rupees for a general service. Will be adhering to the service schedule per the manual. 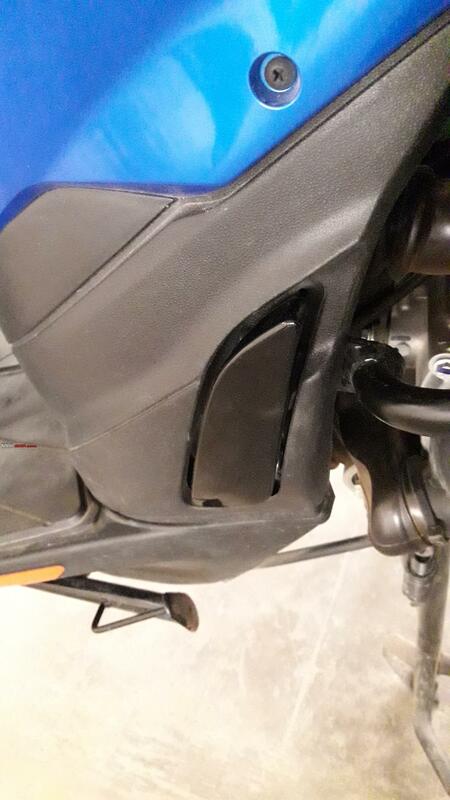 I had on previous occasions skimped on giving my pulsar for regular services while only doing a oil change regularly and there was no follow-ups from the manufacturer either. 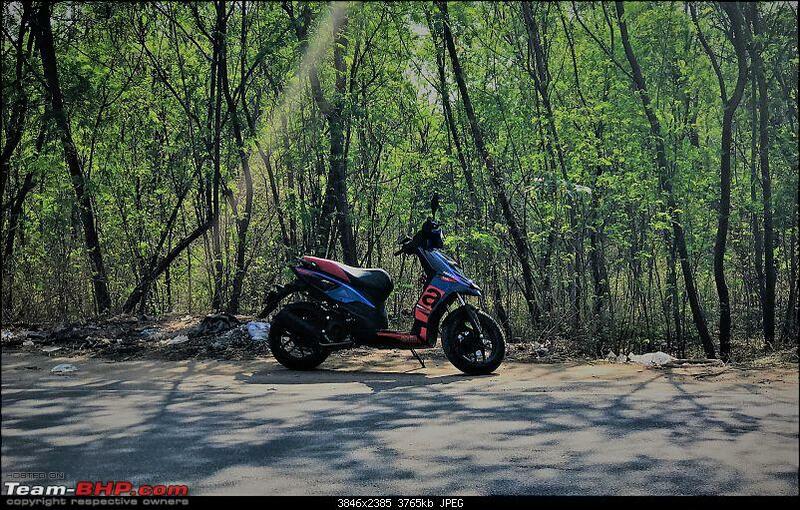 The engine of the SR 150 is rated at 10.06 HP @ 6750 with a 10.9 Nm of torque at 5000 rpm. 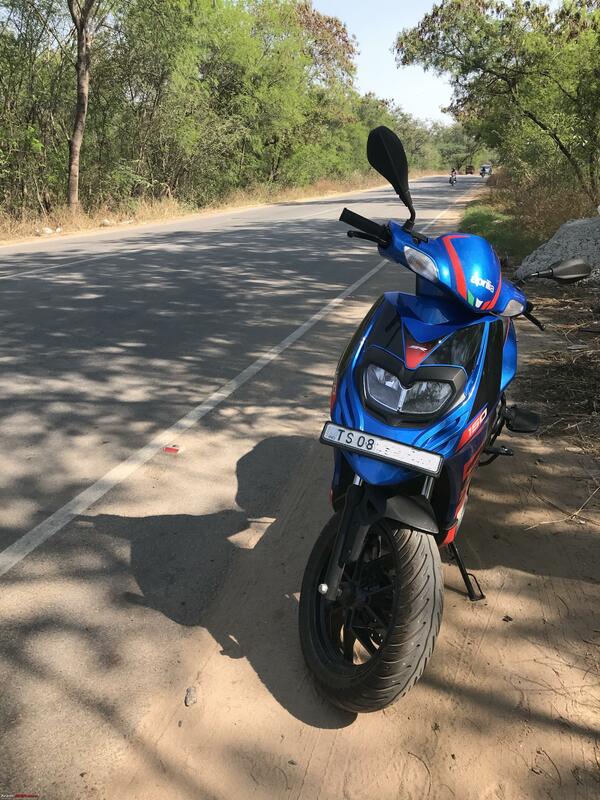 All the technical specifications as it goes, in the real world the SR feels sluggish as we move off the start line, the fun starts after crossing speeds of 45 to 50 KMPH as on the speedometer. 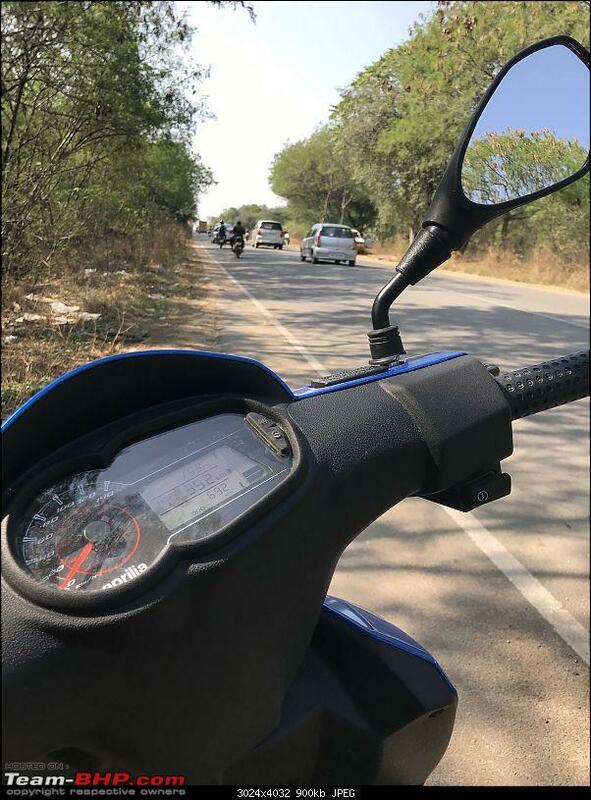 The top speed is marked at 95 KMPH although users have posted figures of 120+. Seems to be a case of an overoptimistic speedometer in the works rather than an actual speed as such. Reaching the limit wouldn’t be difficult at all however, once my 1000 KMS for the running in cycle are done can move to that zone on open stretches. My daily commutes have been limited to within the city right now, planning to undertake a highway run in the near future. One thing which concerns me is the headlight throw, the stock bulbs themselves are OK for the road I take, which is well lit. The low beam is still usable but the high beam is set to throw a straight beam which basically stares into emptiness with no real use. Have to ask around the service folks if it can be adjusted during the service or if I can do it myself. 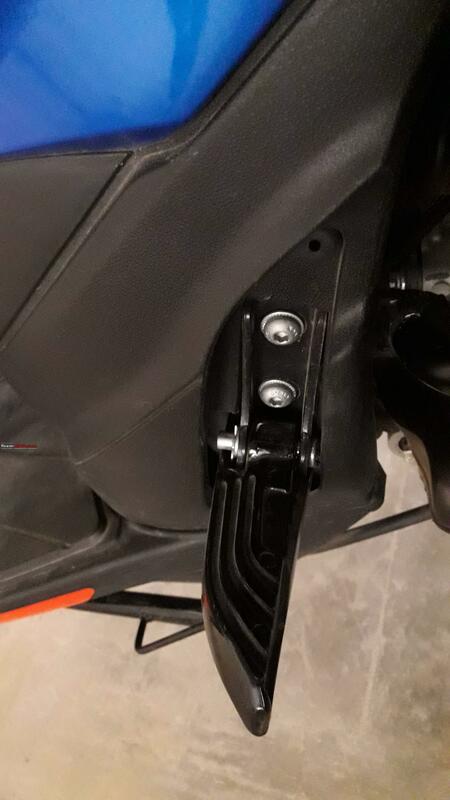 The headlamp cluster assembly can be easily accessed by removing a set of screws from the front fairing. The main headlamp bulbs are of Osram make of 12V, 35/35W specifications. Not on the lookout for an upgrade right now maybe a few years down the line. There is a way to keep both the lamps turned on as well by keeping the light switch at the mid position (not an easy task IMHO), I have been using this as an alternative to a headlamp upgrade, works quite well. I haven’t experienced any issues with the lamps being in the fairing instead of the handlebar. 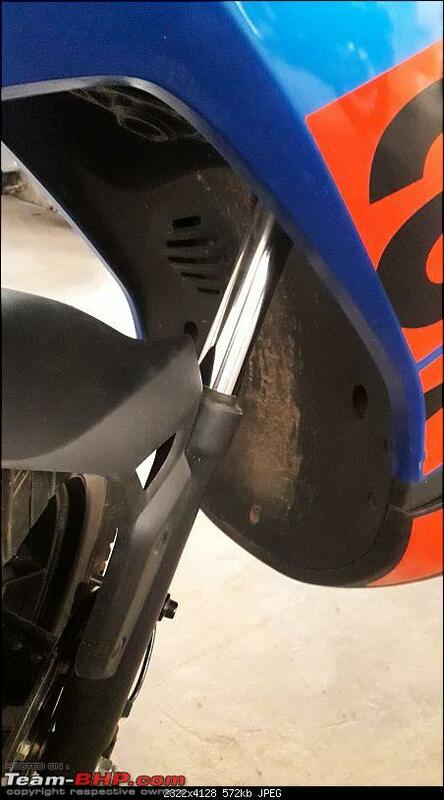 For the first time I realized that the protrusion in the rear mudguard just above the number plate houses a light. 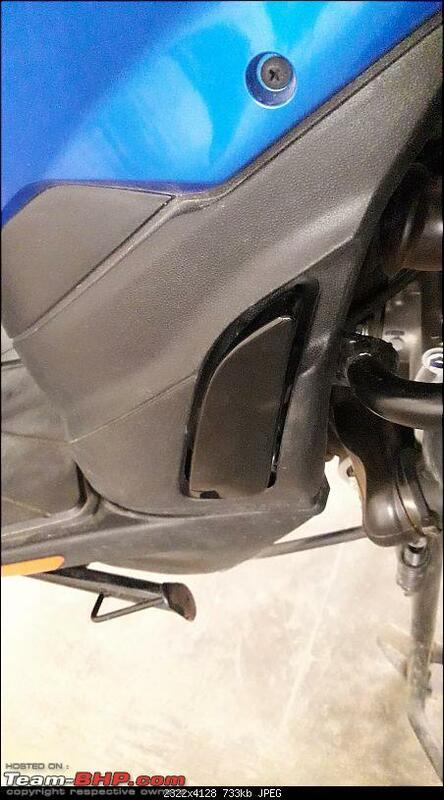 I had seen that in so many bikes without ever knowing what it was, it might have been there in my pulsar as well. It was my “8 in the middle of the 8 of diamonds” moment, now I cannot unsee what I have seen. The fuel tank capacity is of 6.6 litres out of which 1.2 litres is reserve which in the real world translates to around 200 kms before the tank runs dry. The digital speedo is a boon as it has what my pulsar and Alto didn’t have in their respective consoles, an option to check time and I am elated. I have this weird habit of checking the time frequently so this comes as a blessing. The under seat storage on my SR right now has a Vega Cruiser half Face helmet, a jopasu mini duster, my riding gloves, the tool kit and the first aid kit so it kind of gobbles up everything that I throw at it. The storage area won't fit a full face helmet though and if we think of putting it on the floorboard it won't fit there as well. So when I buy that full face I am eyeing I will be minus the convenience of putting the helmet under the seat, have to get a cable lock or something but that's liveable. Not that I use it very often but there is a provision to charge the phone as well through a USB slot. I had paid for the connectivity option upfront and am waiting for the connectivity device to arrive (which has been taking ages), it is not as comprehensive as the one on the TVS Ntorq but just went ahead with it out of impulse anyway. I am not sure it will be any more helpful than when I do not have it. Key hole is hard to reach or find rather. Misses are certain when dark etc. Other Scooters for comparison, easily accessible key area. Twin pod headlamps, throw is a problem. I have been driving with the switch in the middle which lights up both the lamps in low beam, much more useful and brighter this way. No issues till now. 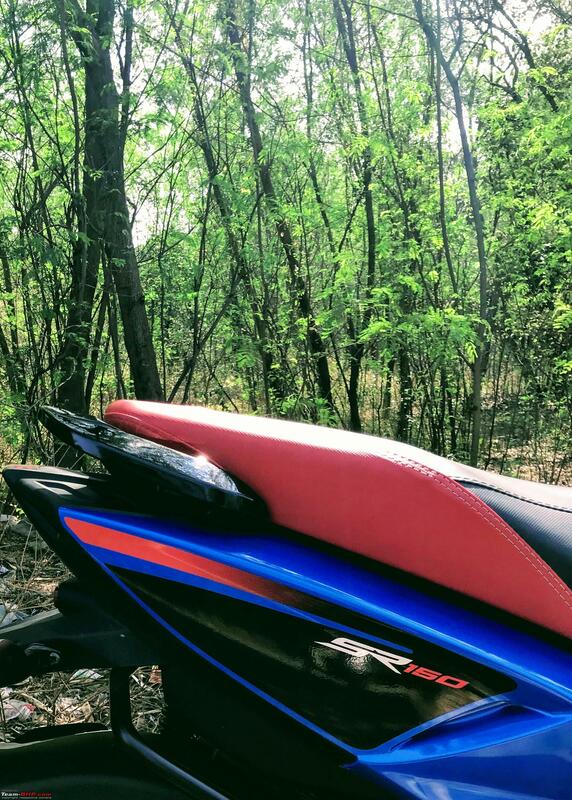 And finally at the end of this thread I feel a sense of satisfaction when I look at my SR 150 and that's all there is I believe. And to all the TBHP folks who put up their own experiences on the SR here, thanks to everyone as it guided my decision ultimately. Note from Support : Thread moved out from the Assembly Line. Last edited by CrAzY dRiVeR : 15th January 2019 at 15:15. Congrats on your new ride and may she continue to give you happiness in all your rides. 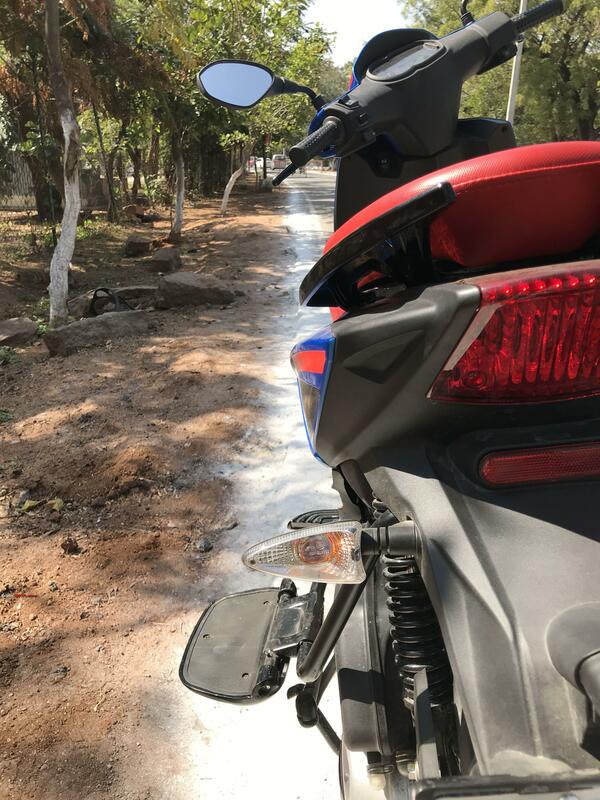 Initially I did book the SR 150 during launch, however gave up after the test drive because of the bone jarring rides on bad roads. Otherwise this is a great scooter to ride. I sincerely hope they launch a version with softer suspension and would pick it up immediately. Congrats on the ride, sandx! 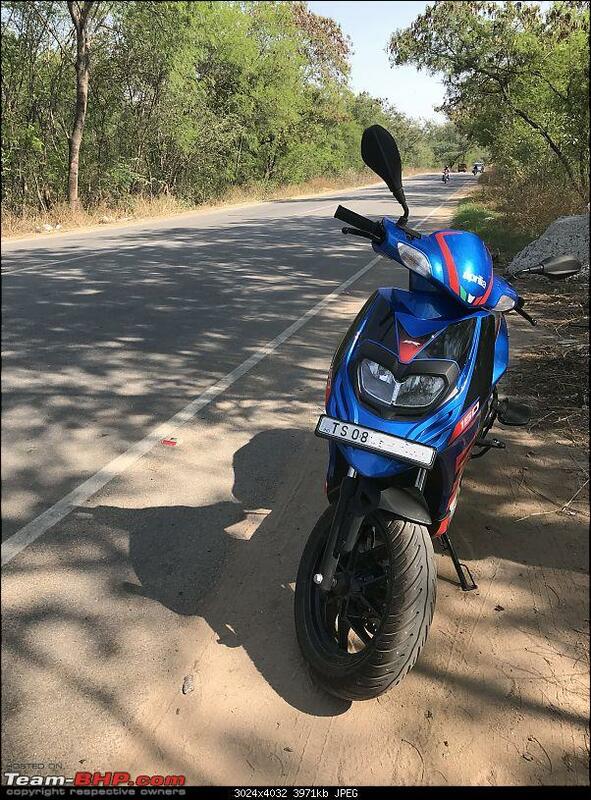 The blue looks really good, infact seeing this colour on the SR150 for the first time. Was this introduced recently? 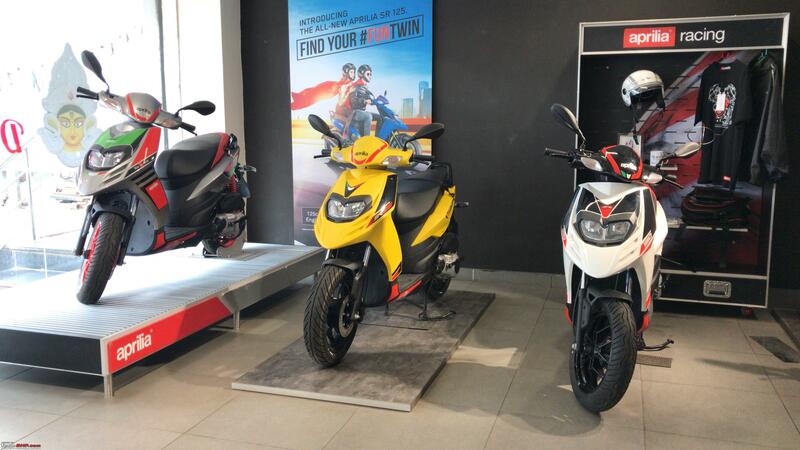 When I checked out the scooter sometime last year - the only options were the black and a red'ish sport variant. Plastics are pathetic on most scooters - But an occasional application of Meguairs Natural Shine could help retain the natural black colour. My ~7 year old Maestro plastics are still surviving from turning grey, thanks to this product. Thanks CrAzY dRiVeR. 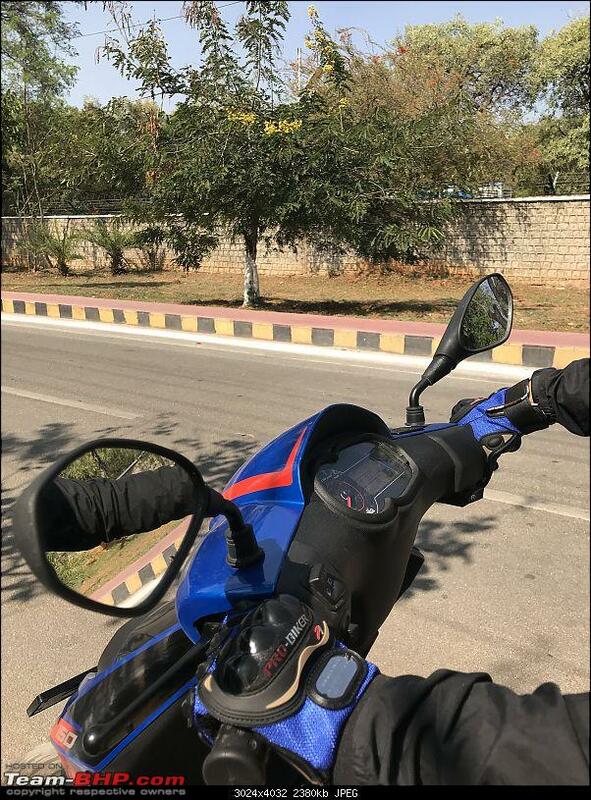 The blue was available only on the SR 125 initially, but was introduced later when the digital speedo upgrade came along. That helped partially to make up my mind as well. Noted the tip on the plastic upkeep. 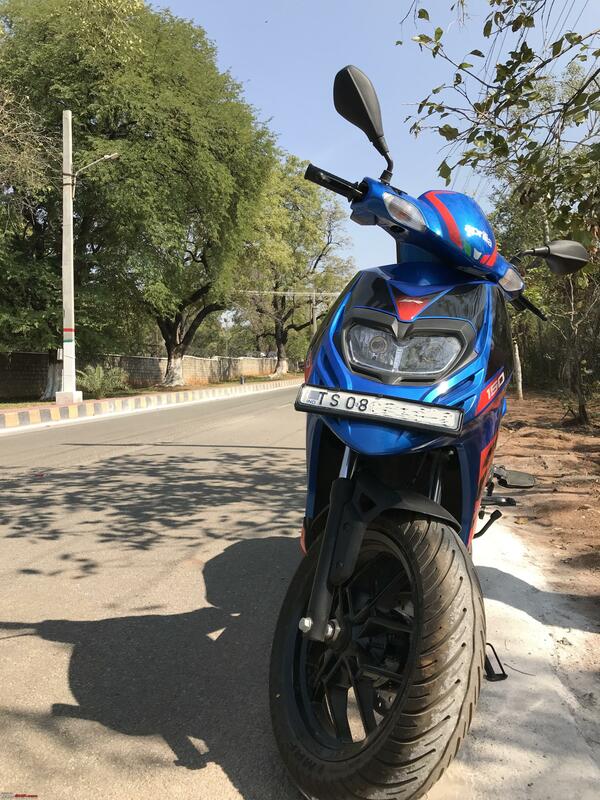 It has been 18 months since I bought the Aprilia 150 SR. 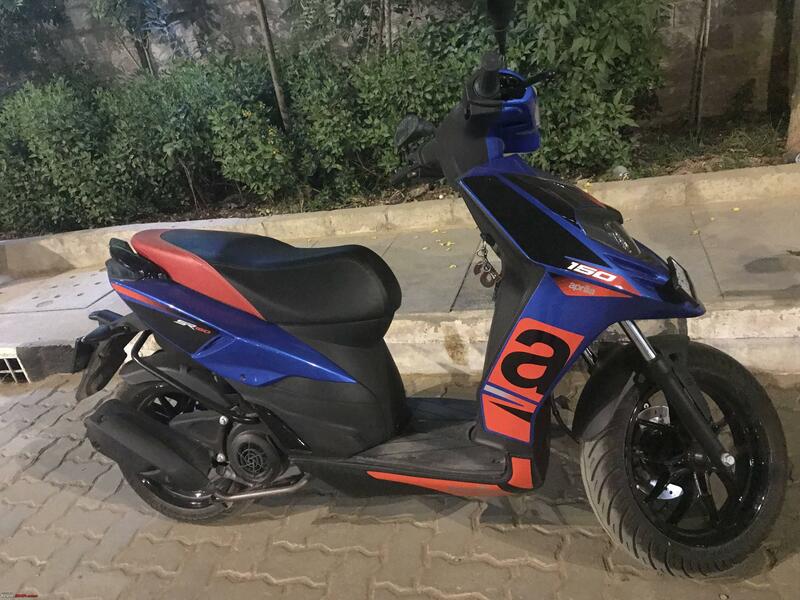 Though I could appreciate the performance and handling of this scooter when compared to Honda Aviator, the other scooter I own for the last 11 years, it was only after riding the Aprilia for some longer time that I started feeling that Aviator has a handle bar which is disconnected from the bike itself, like a gaming remote control. 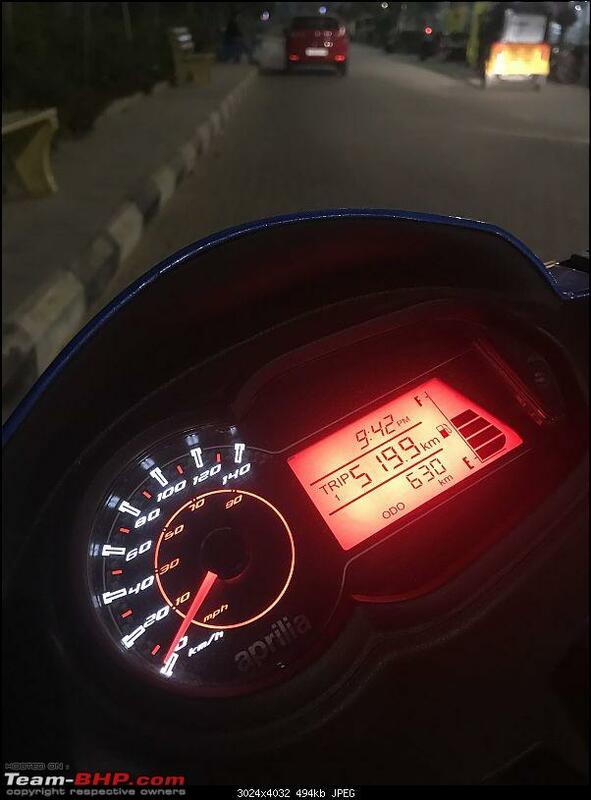 Aprilia feels so connected. The most important thing I love in Aprilia is the brake. 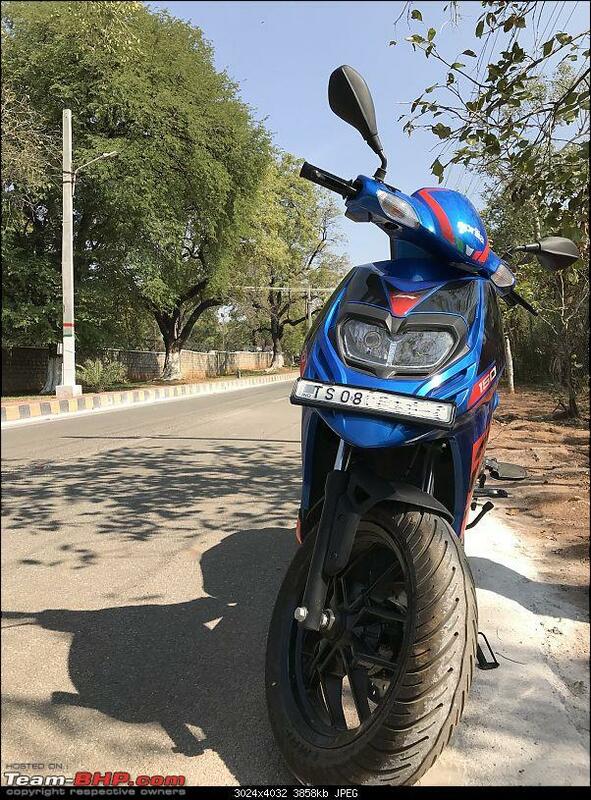 After using Aprilia, I have concluded that Bajaj Pulsar 150 (another bike I own) and Aviator (disc brake version) don't have brakes at all. Aprilia's brakes are just too good, always confident and very effortless in stopping. Awesome and very informative review mate. As I mentioned earlier as well, the blue shade looks amazing. Wish you many happy miles on the SR.
Congratulations on your new bike. 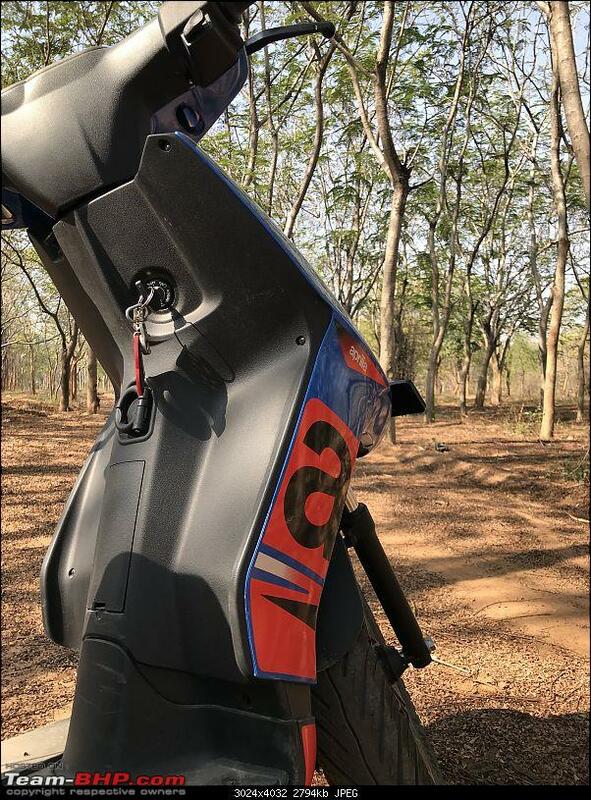 Can you shed any light on the new adjustable rear shock absorber that comes with the updated SR 150 ? If not now then possibly find out more at your next service. 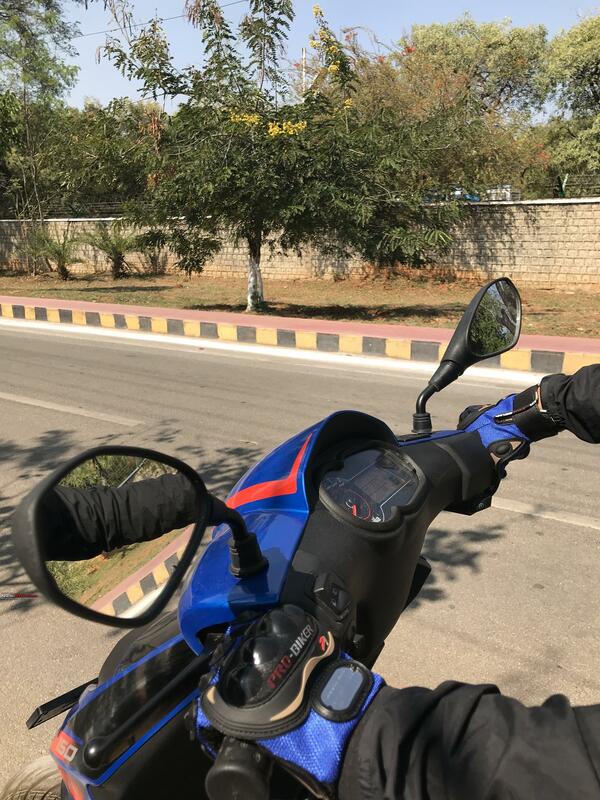 I started feeling that Aviator has a handle bar which is disconnected from the bike itself, like a gaming remote control. 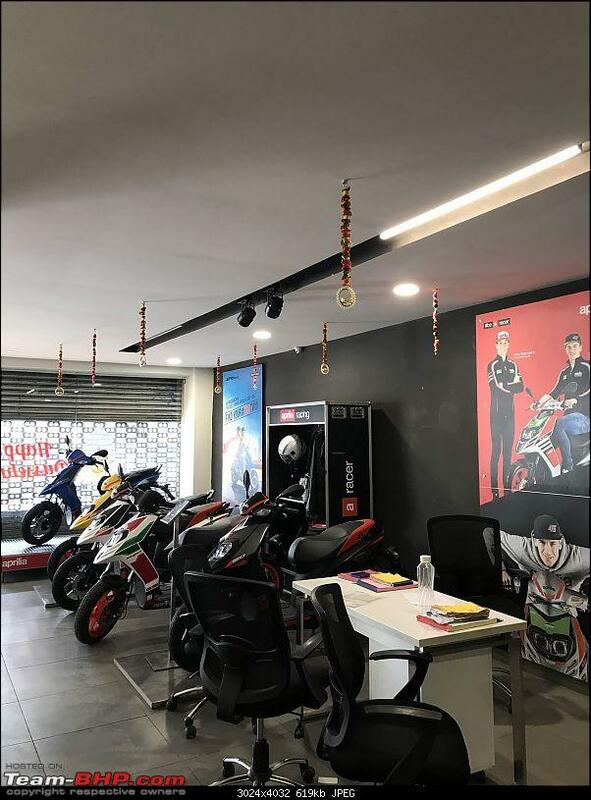 Aprilia feels so connected. Scooters have a mind of their own. 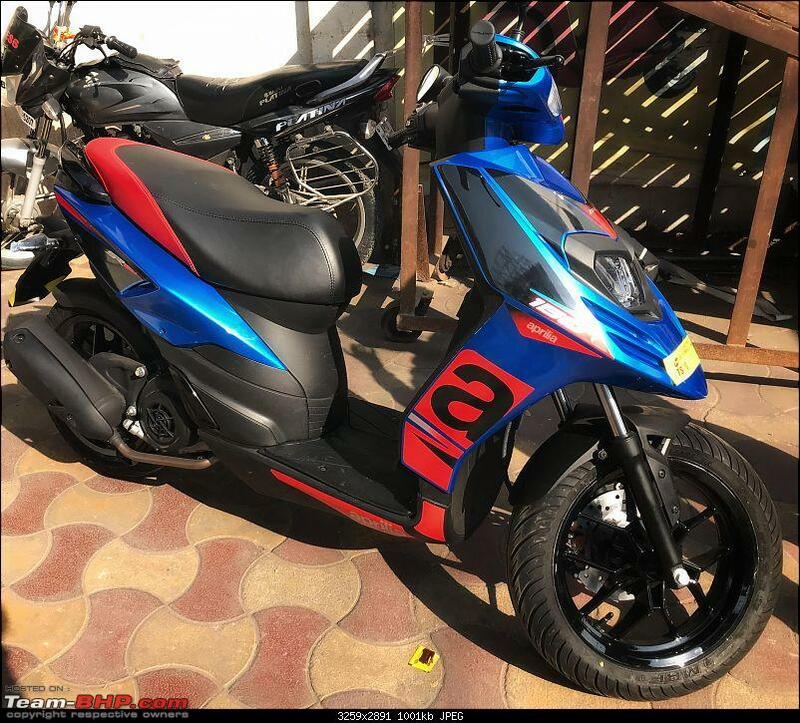 The Aprilia is a different breed altogether. 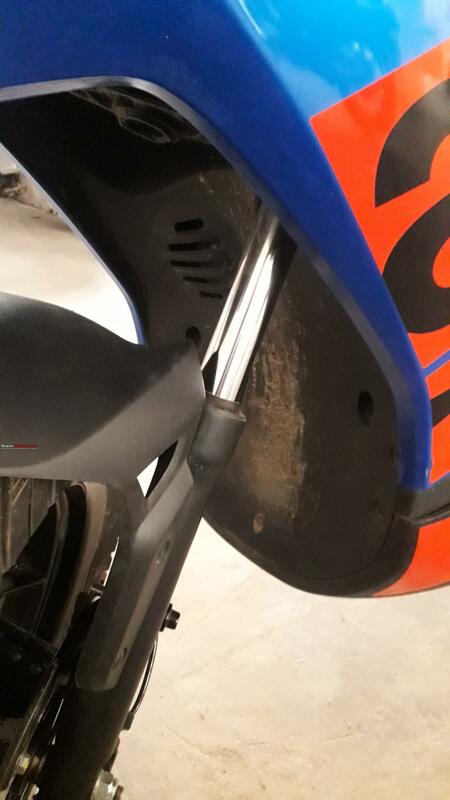 Hey nixie89, Aprilia has knowingly sacrificed the suspension aspect in favor of handling. However it could have been set a bit softer, hopefully sometime in the future. Thanks Mortis. The rear adjustable shock is pretty much useless. It is similar to the ones you see on any commuter bike. So if you want to adjust the shock spring you have to rotate it and there are grooves which set onto a fixed point. The range is not that great as I found out during the second service. 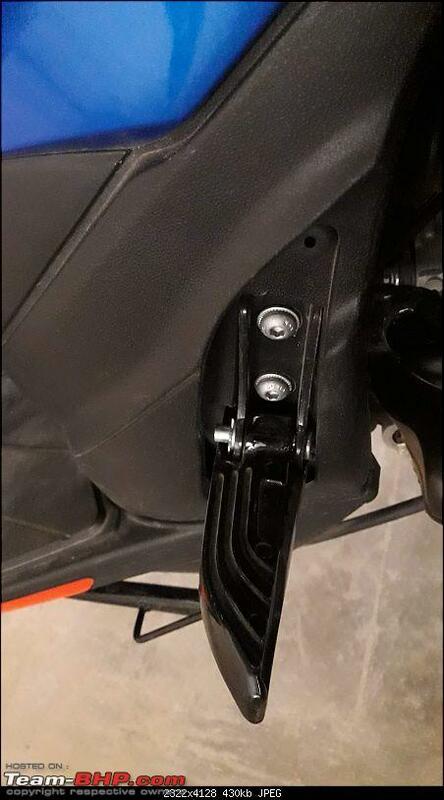 I had asked the suspension to be lowered (to the lowest possible point), could not see any major difference after it was done, the paint on the shock spring chipped at the point where they must have used some spanner to adjust it. Last edited by sandx : 16th January 2019 at 16:30. Lovely report there sandx! 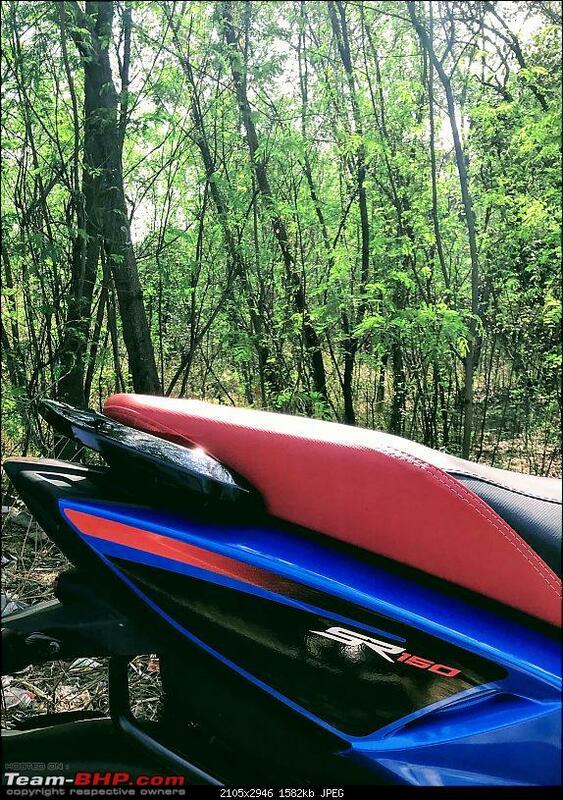 Good to hear about your experience with the SR 150. 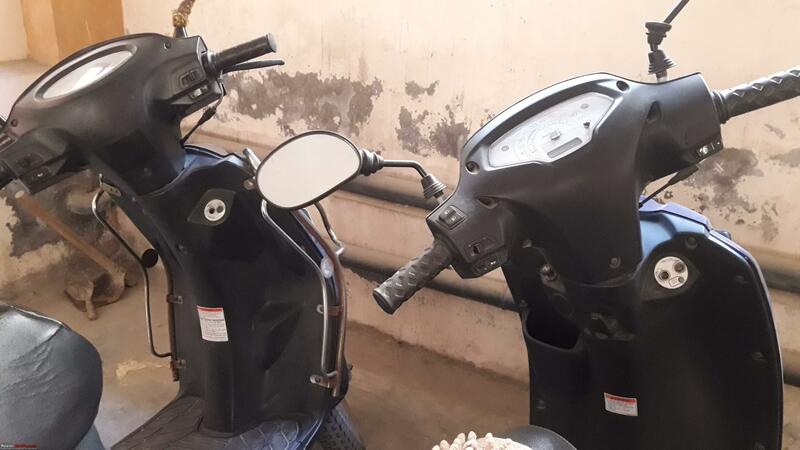 I have a Vespa LX 125 and I can echo most of your observations. 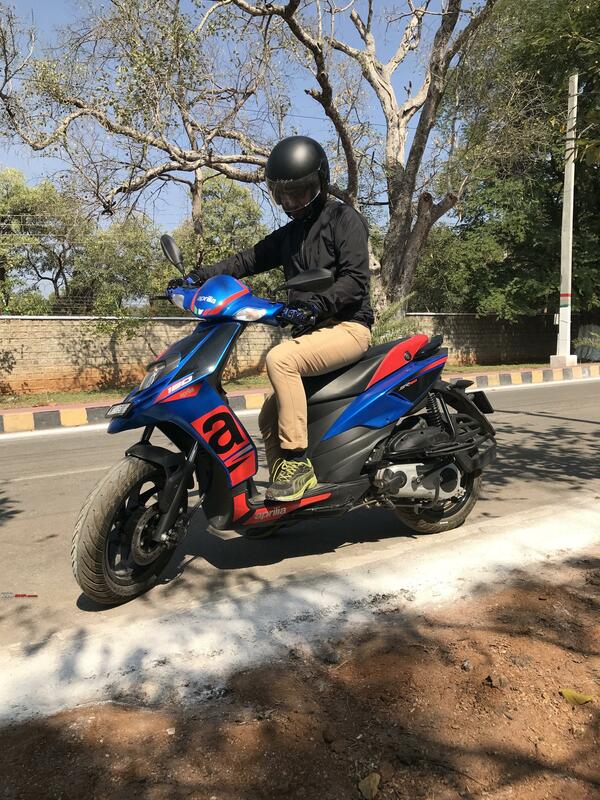 I had test driven the SR 150 ample times (the showroom was 1 min walk away from my former workplace and owner was a friend), but frankly it didn't feel like an upgrade from my Vespa. However had it been launched back in 2015, I would have picked it up for sure. As they say, if you don't turn back and see your ride after parking it, you have the wrong vehicle! Wishing you lots of happy miles on the SR. Cheers! 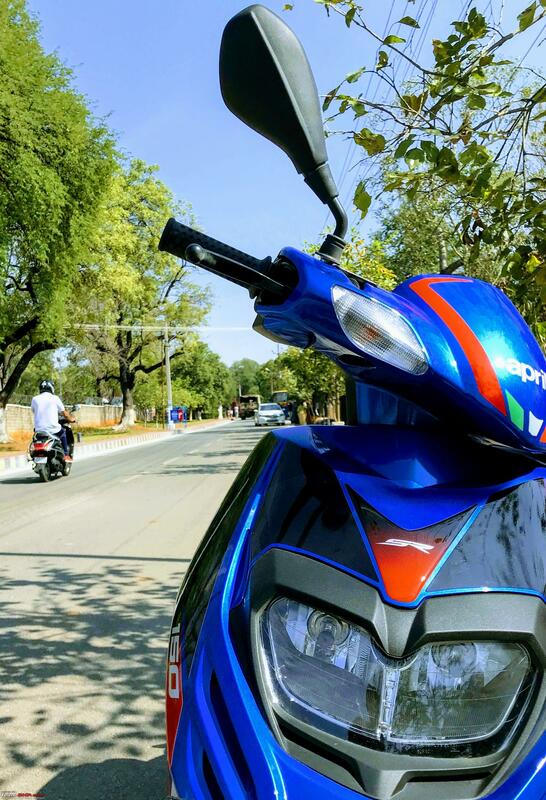 Nice review, blue is a nice colour, not many on the road. The new set of these scooters are fitted with ABS to comply with laws enforcing scooters/motorcycles above 125cc to have ABS. First of all, congratulations sandx on the italian. 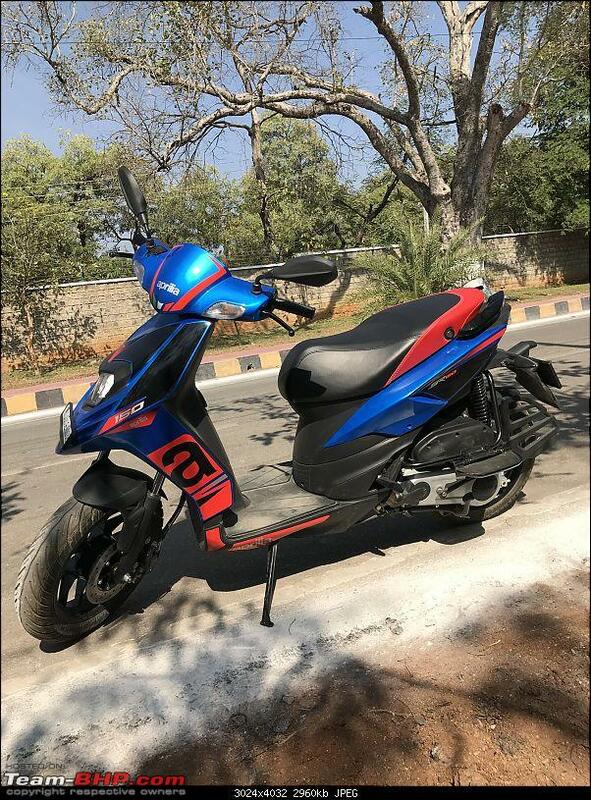 Wonderful scooter this SR150. Wish you many miles on this. 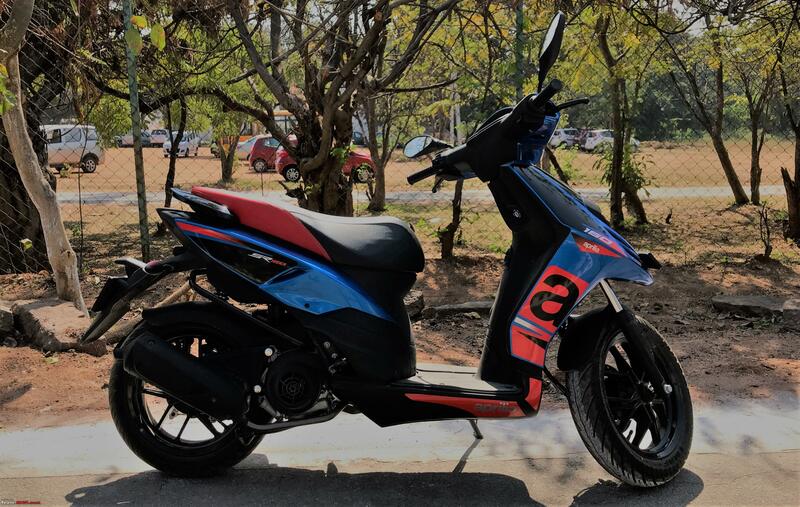 I've seen many people not shortlisting this scooter because it is from the Vespa stable and hey think it is "very" expensive. 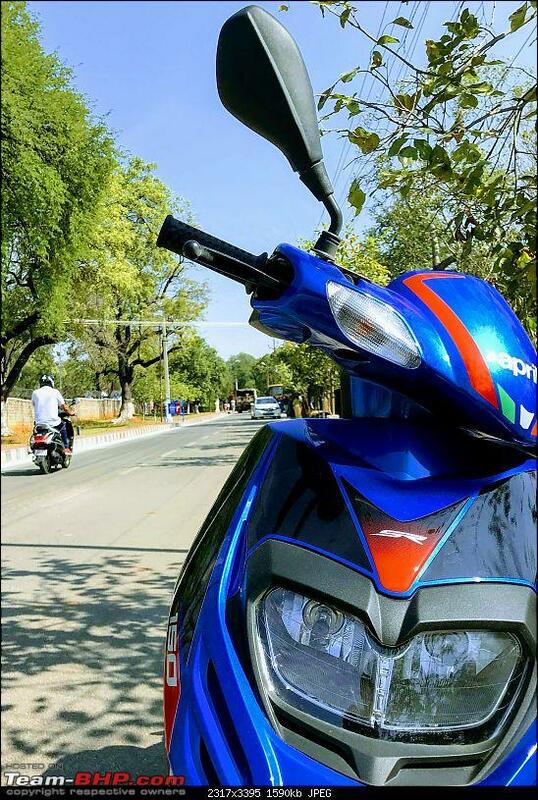 But I feel it's one of the most VFM performance scooters and it is the most funky looking scooter out there.You are so right when you say "Don't test ride the SR150 if you want to buy the SR125". 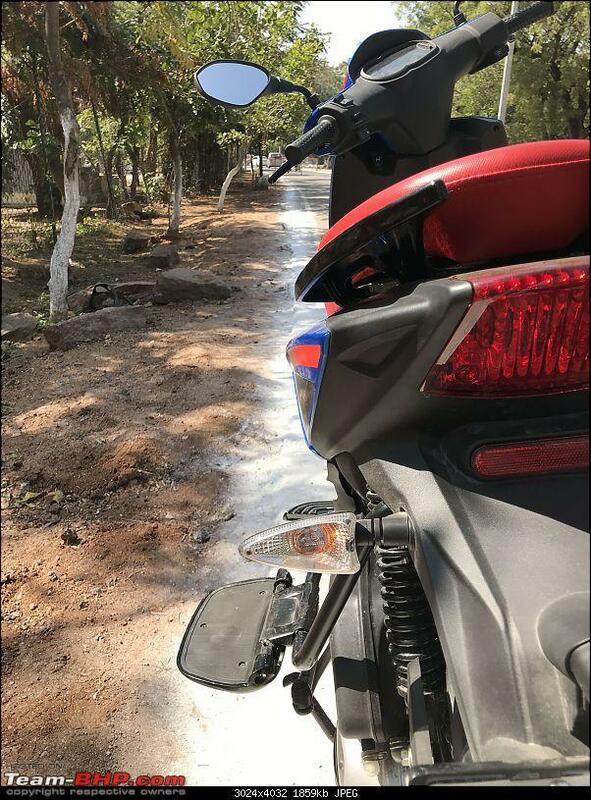 last year I had spotted an SR150 doing a saddle sore ride which shows how capable the scooter is. 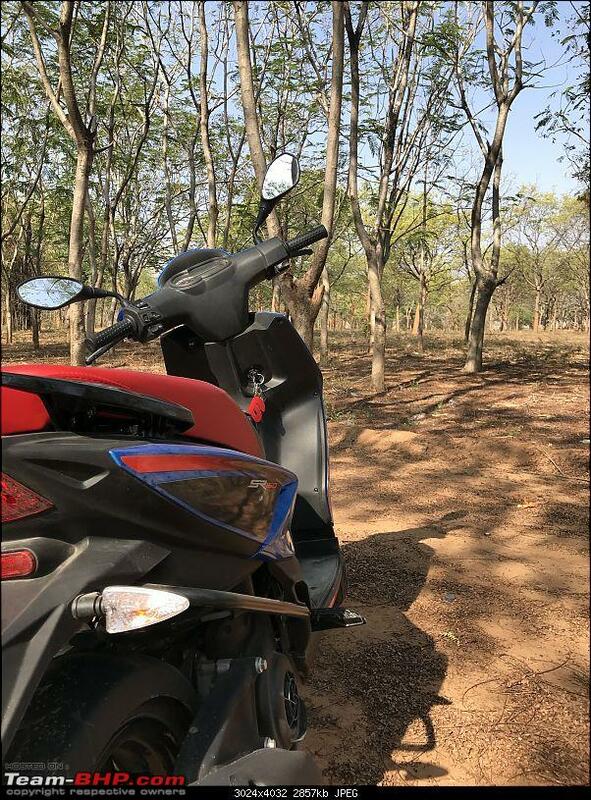 The fuel tank allows for a 250-300kms ride between fills which is again a very good range IMO. the large tyres make it good for bad roads too. True to the T. Thanks blackwasp. Thanks aabhimanyu04. I missed out on the ABS by about a month, but my need was dire, couldn't wait. And the deal offered was too good. Thanks hemanth.anand. 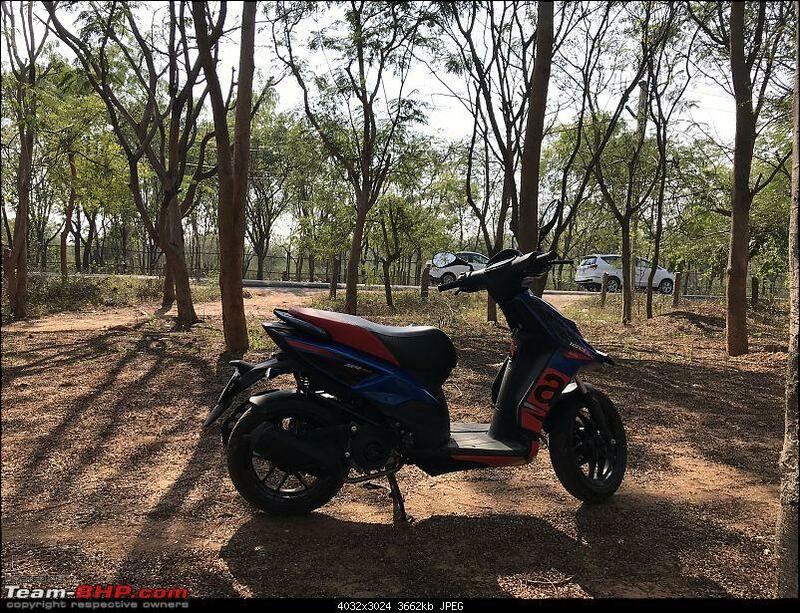 You are absolutely right, the cost seems like a barrier, even I had kept aside anything from the piaggio stable initially deeming the expensive factor. The MRF tyres have a lower load limit than the earlier ones but it doesn't matter in the real world. In fact there is a definite improvement in wet conditions, will be able to gauge it more during the monsoons. Currently my target is finishing up the run in period as soon as possible.